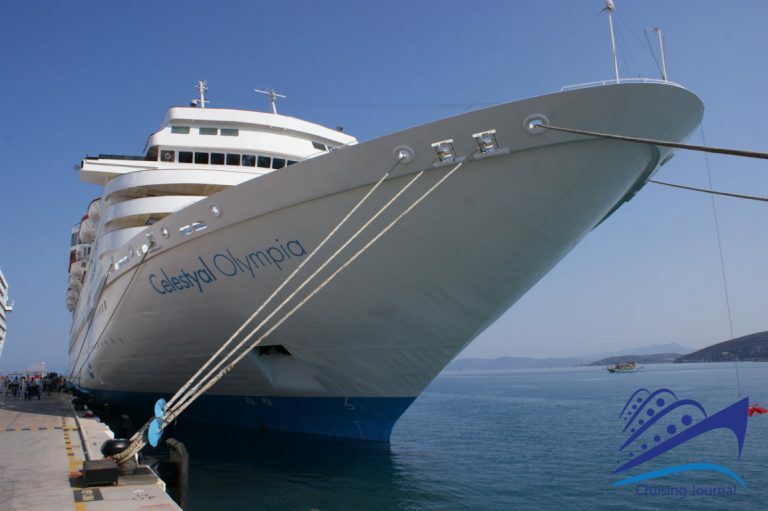 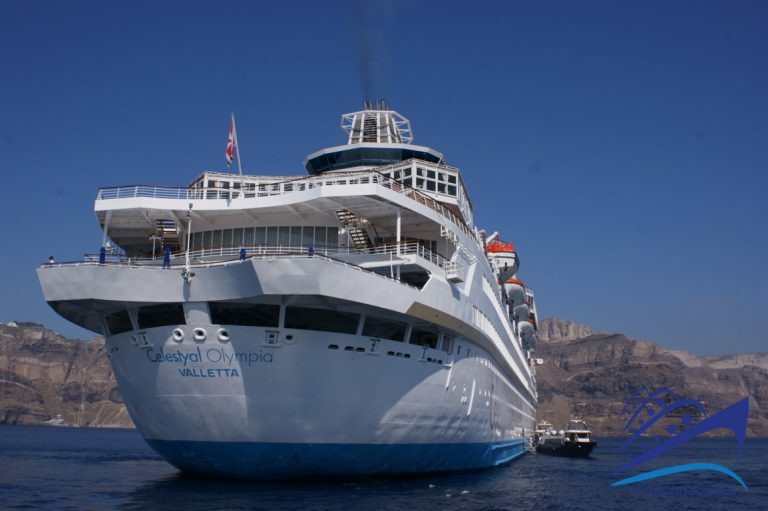 The story of Celestyal Olympia, a ship of Celestyal Cruises‘ fleet, is quite long. 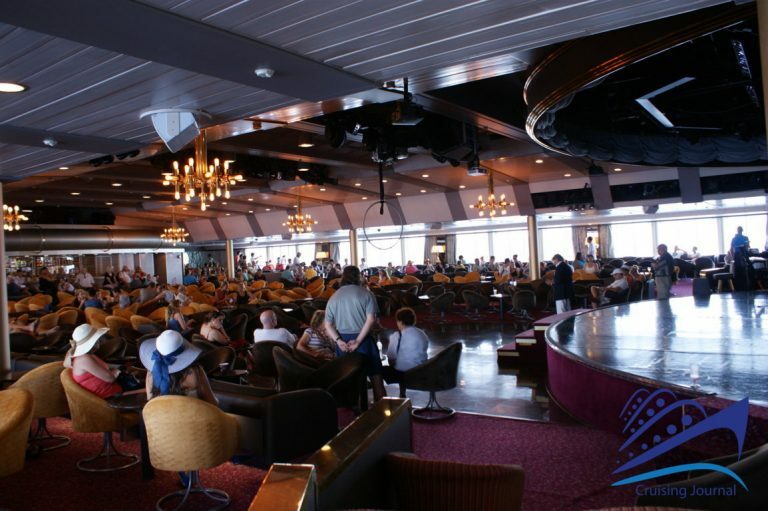 The ship entered in to service in 1982 for Royal Caribbean Cruise Line, with the name Song of America, and operated mostly in the Caribbean until 1999 when it became part of Sun Cruises and was renamed Sunbird. 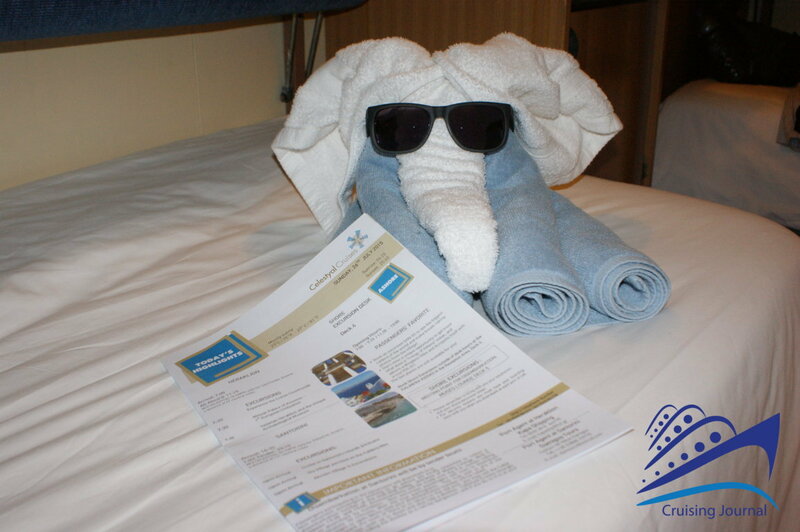 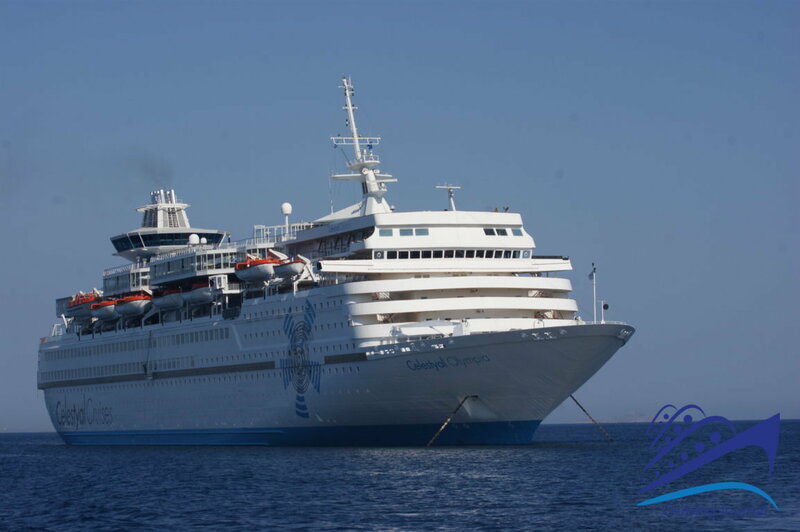 From 2004 until 2012 it was rented to Thomson Cruises and used the name Thomson Destiny. 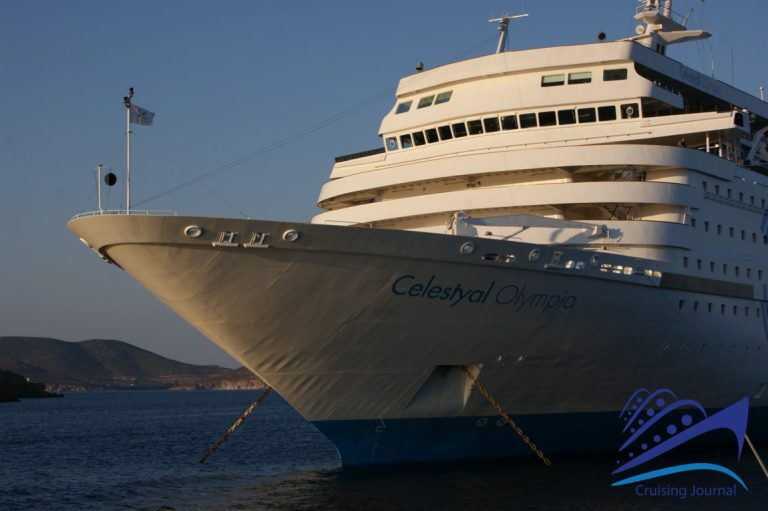 The acquisition by Louis Cruises came along with another name change, this time to Louis Olympia and finally to Celestyal Olympia in 2014. 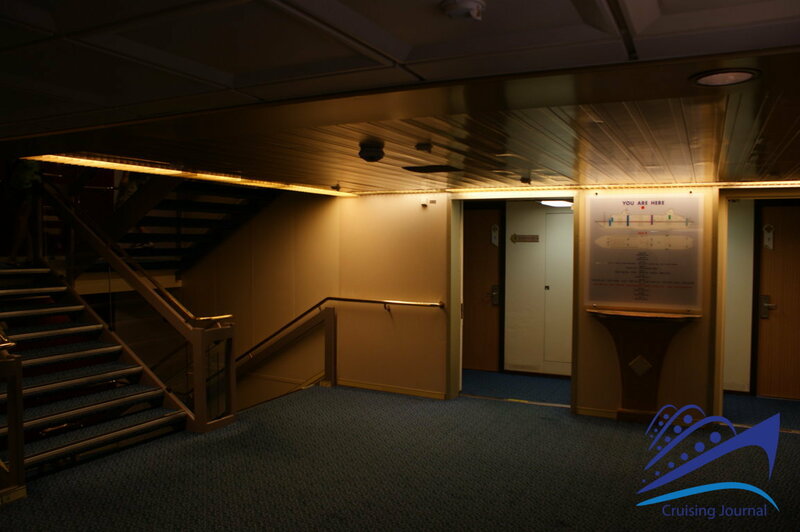 Today the ship is still in good condition, but without a doubt it cannot compete with the ships that are more avant-garde and modern. 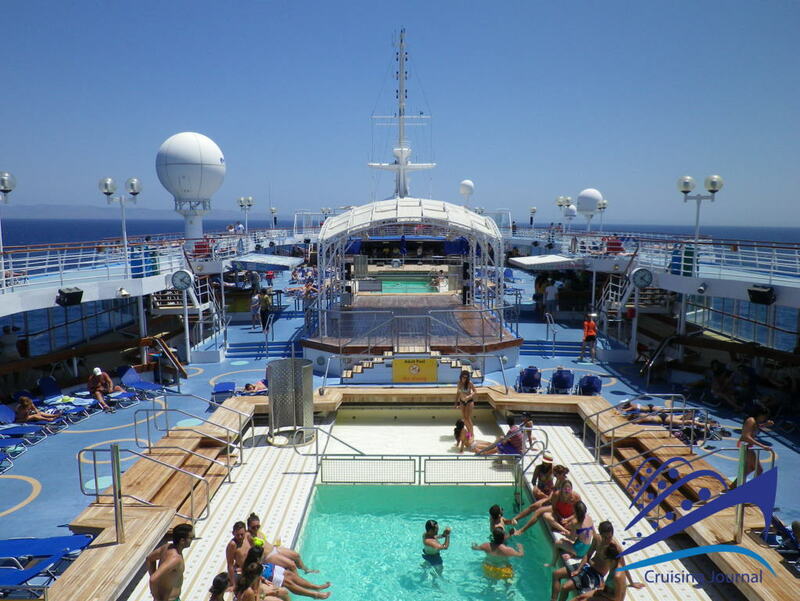 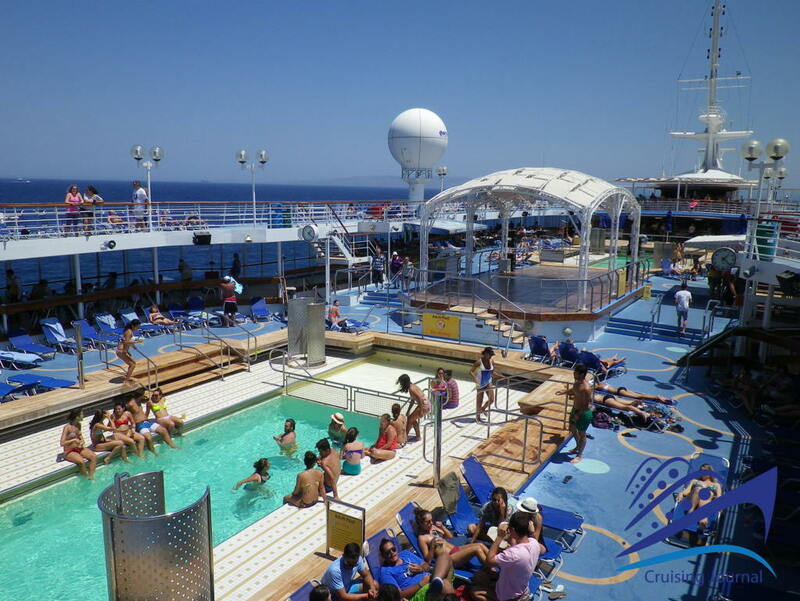 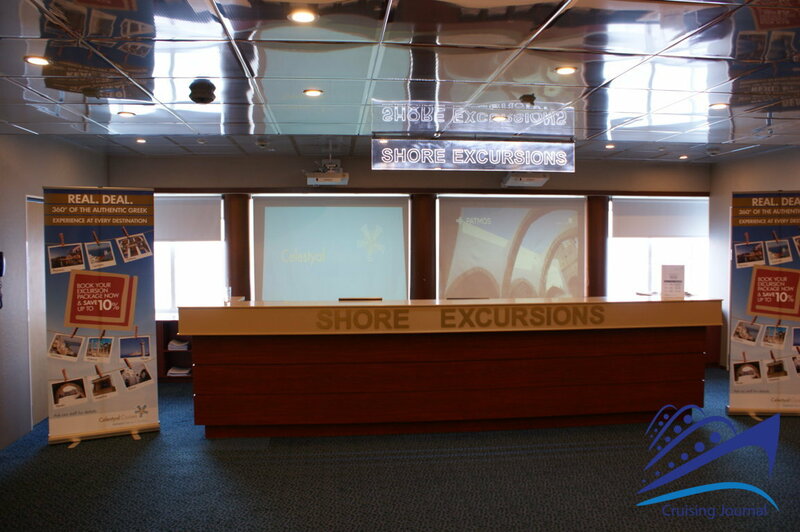 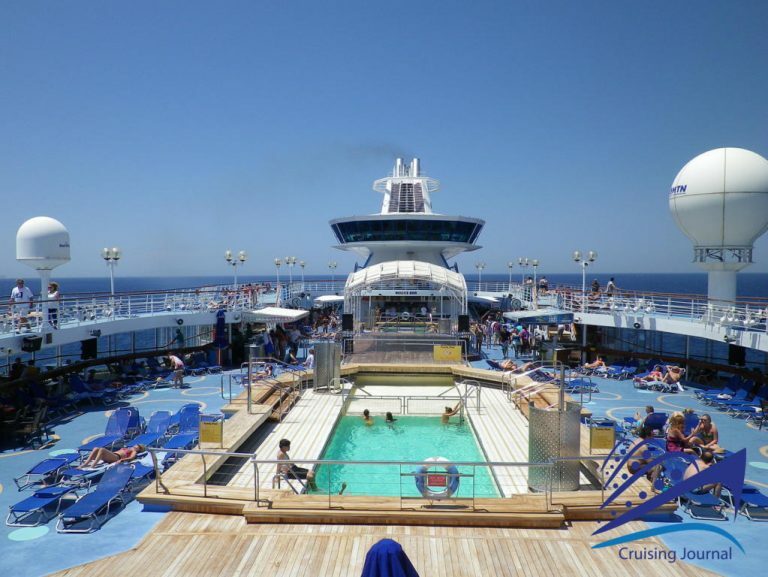 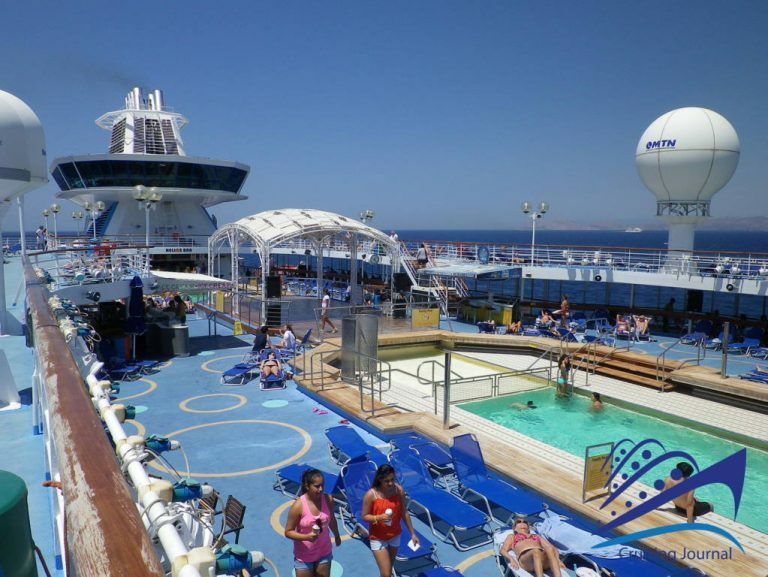 Nevertheless its characteristics could be very interesting to lovers of vintage cruise ship style, without any particular interactive attractions or extravagant entertainment. 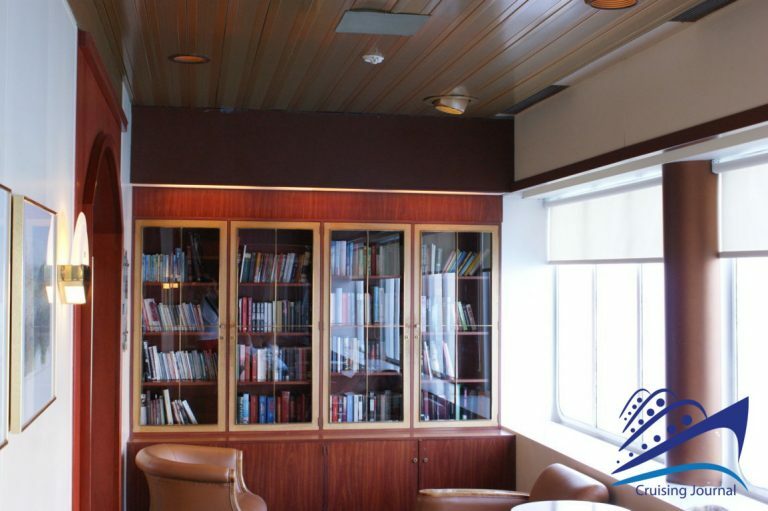 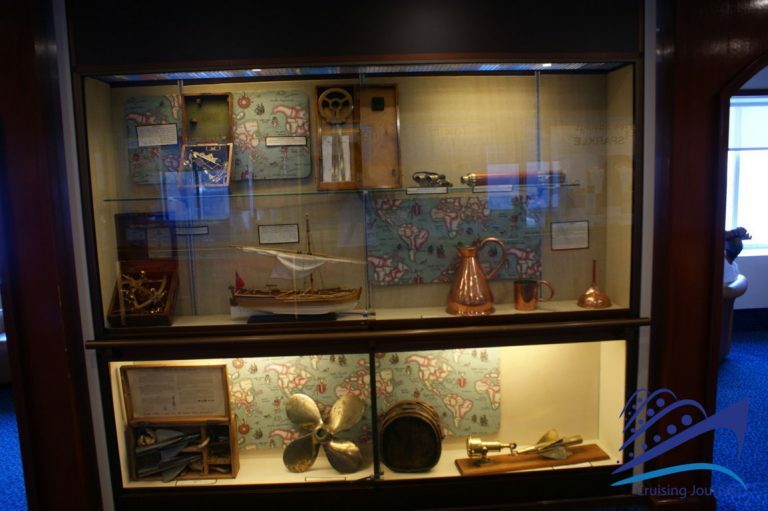 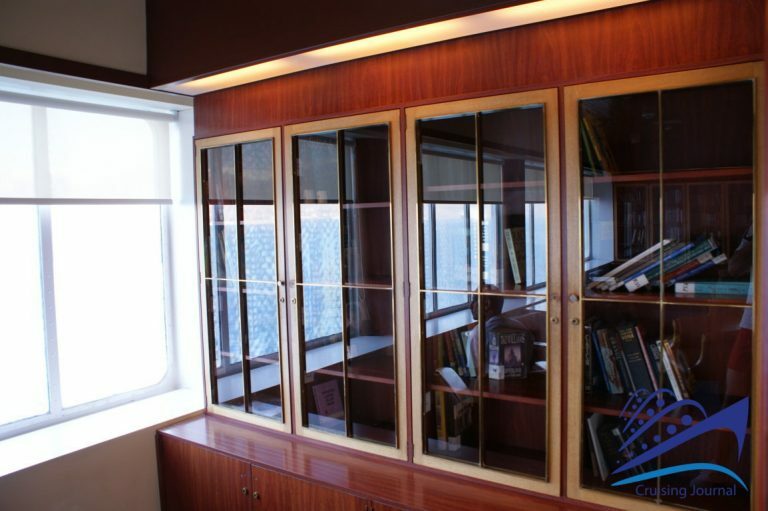 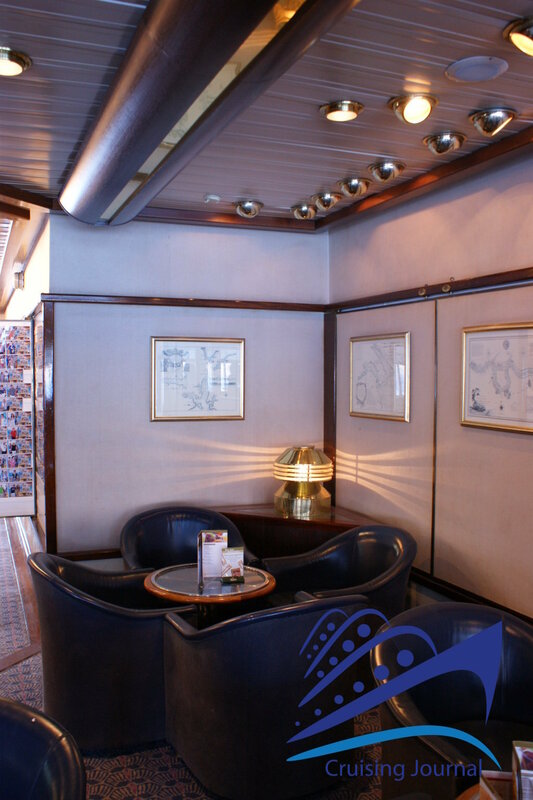 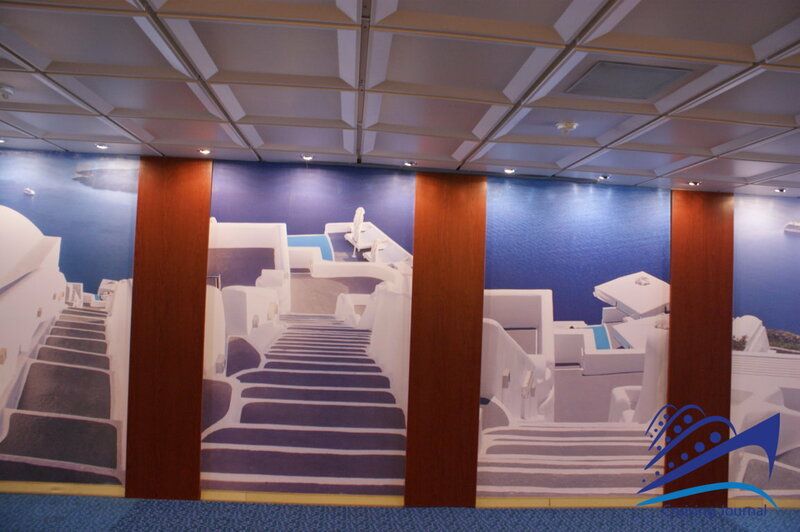 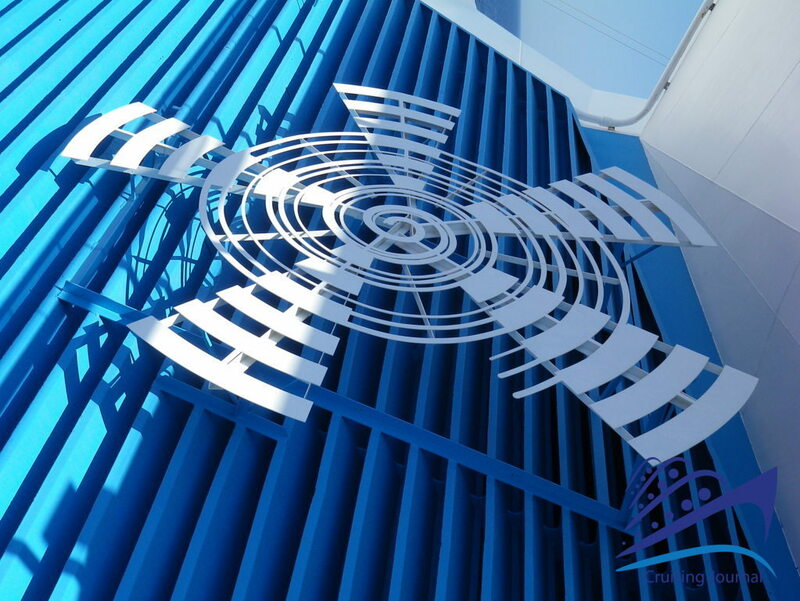 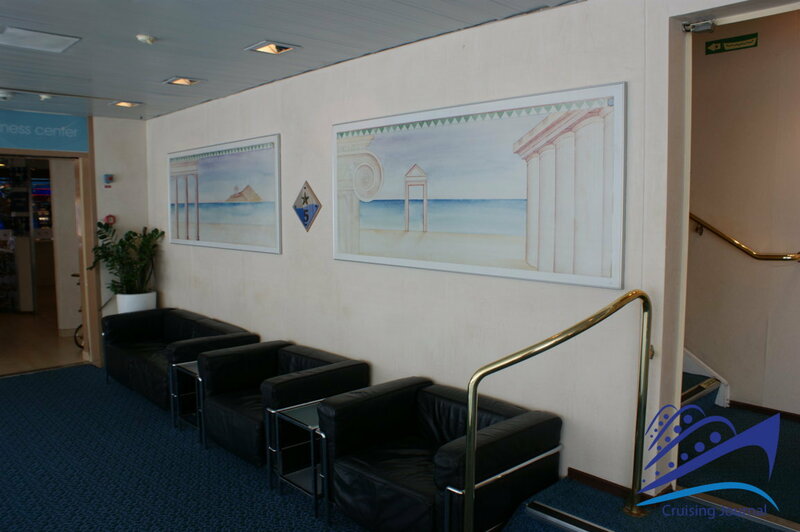 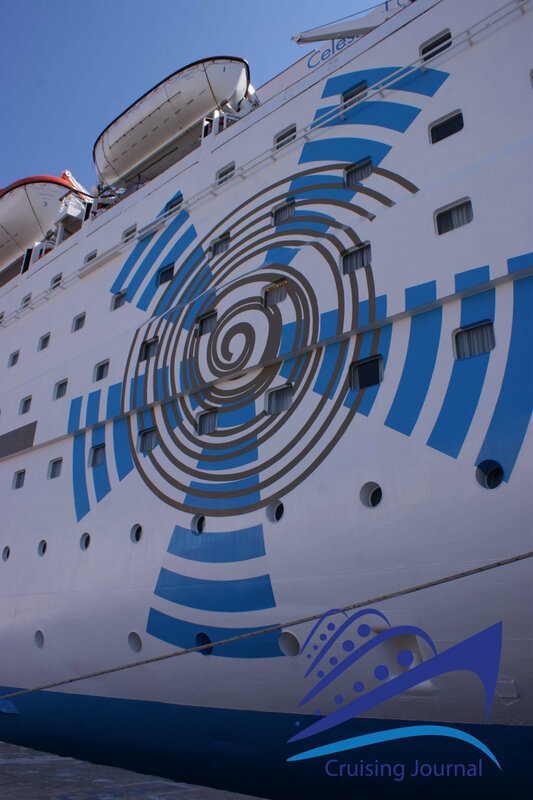 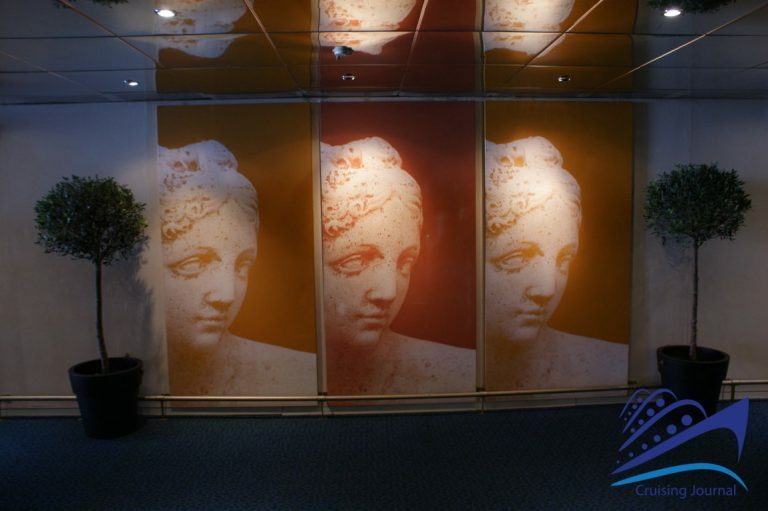 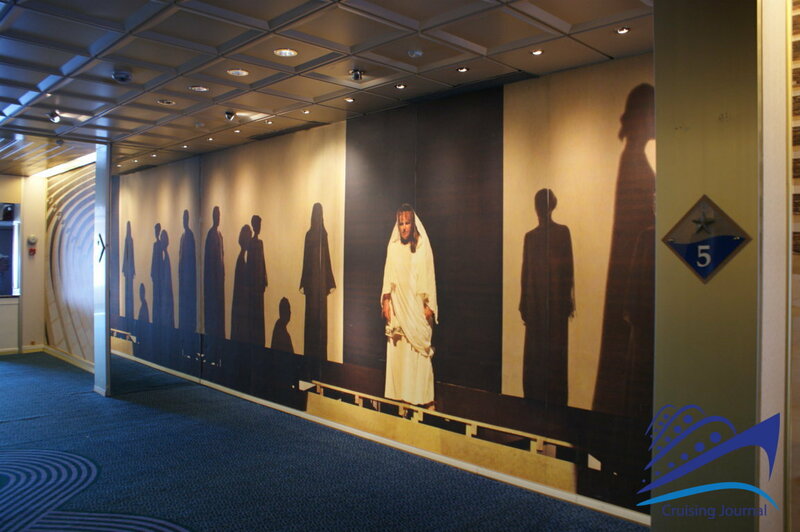 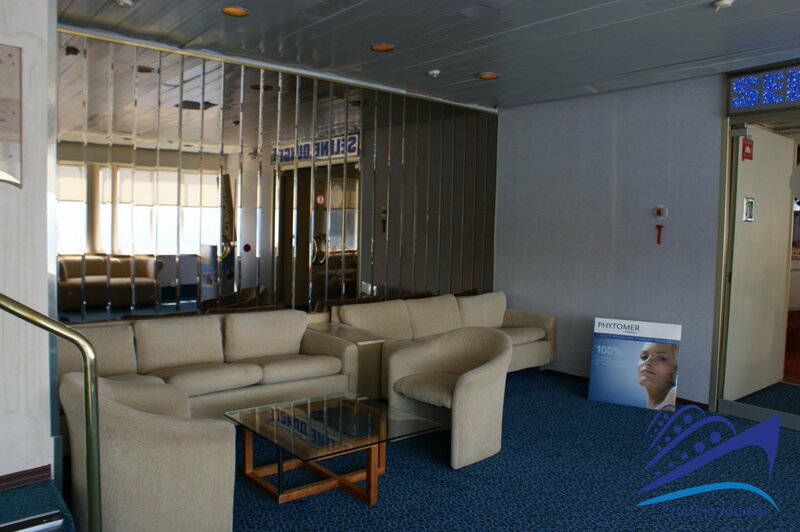 The ship’s common areas, such as staircases and corridors, are decorated using the theme of nautical charts or of Greece. 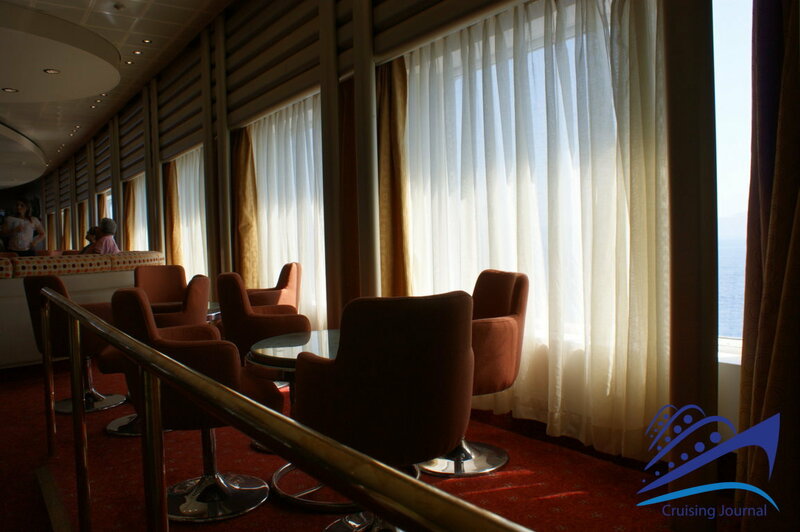 They are simple but pleasing taken in their entirety, whereas the furnishing in the rooms inevitably gives the appearance of a ship designed in the 80’s which is not very modern. 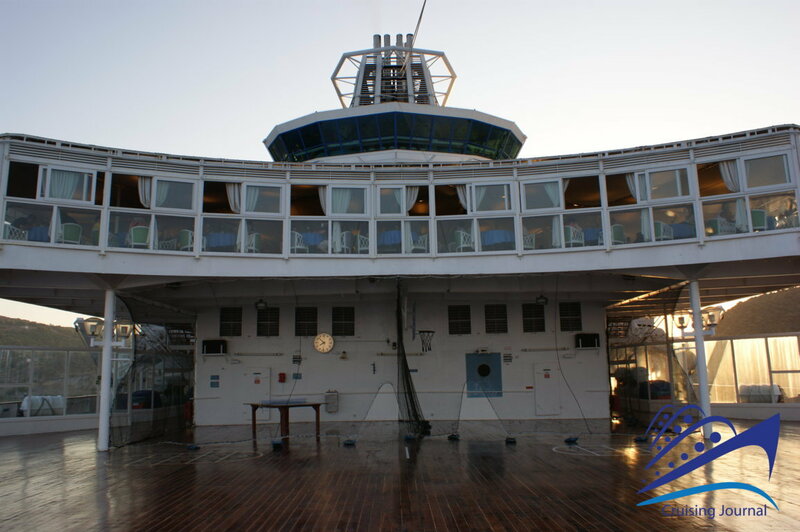 With its 12 decks it can host up to 1611 passengers in internal cabins and external cabins with windows, the majority with two separate single beds. 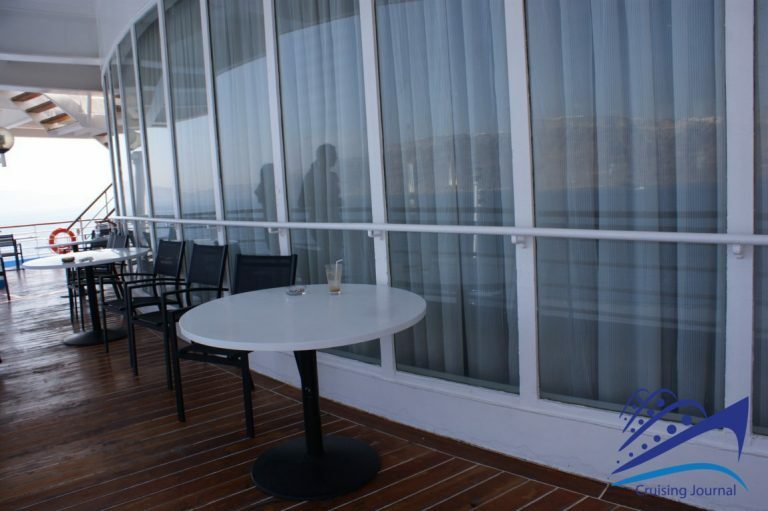 There are very few balconies available and they are exclusively reserved for the Suites and Grand Suites. 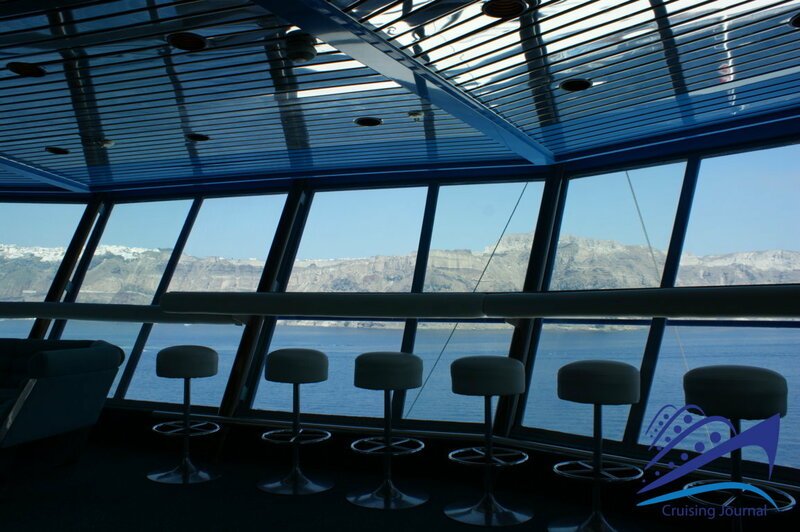 On deck 14, inside the raised circumference clearly visible from the profile of the ship, is the Horizon Bar. 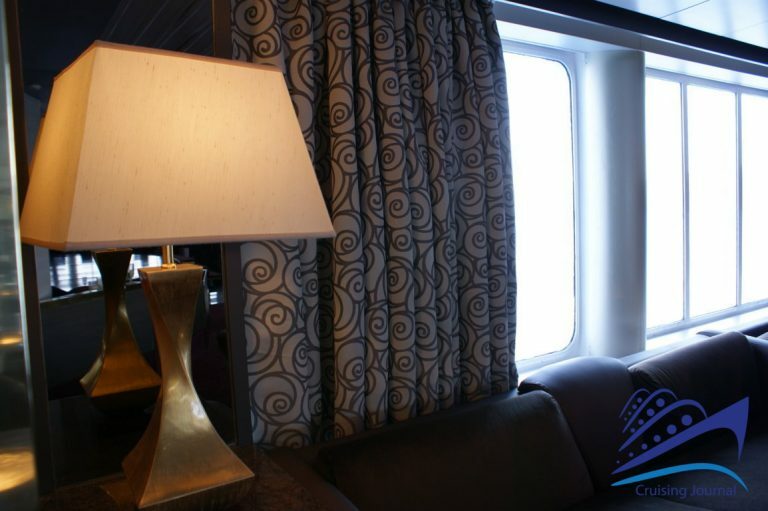 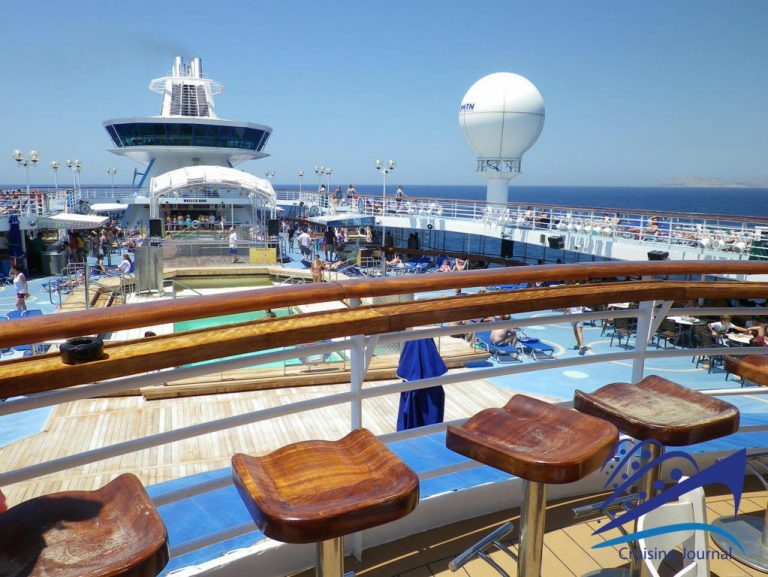 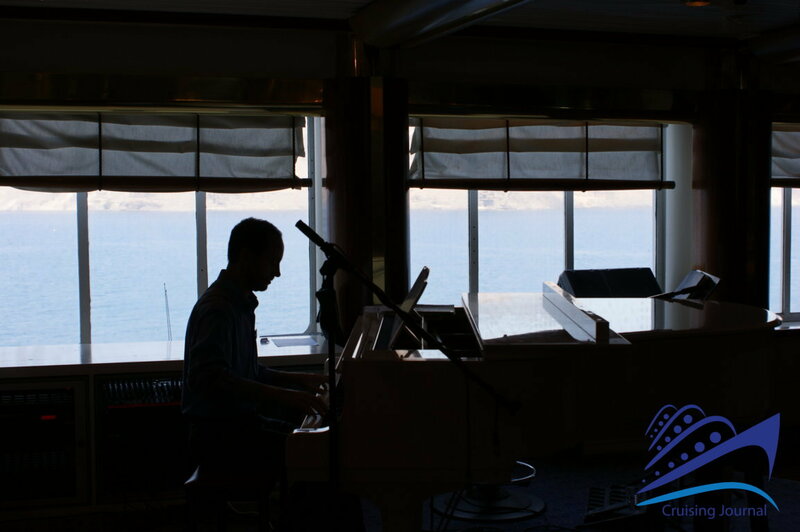 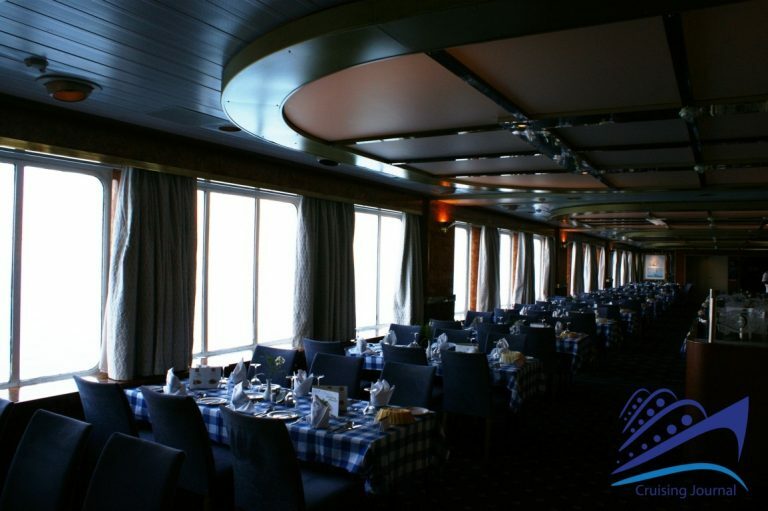 It is a beautiful setting, not only for its position looking out over the sea and the rest of the ship, but also for its classic and modern décor. 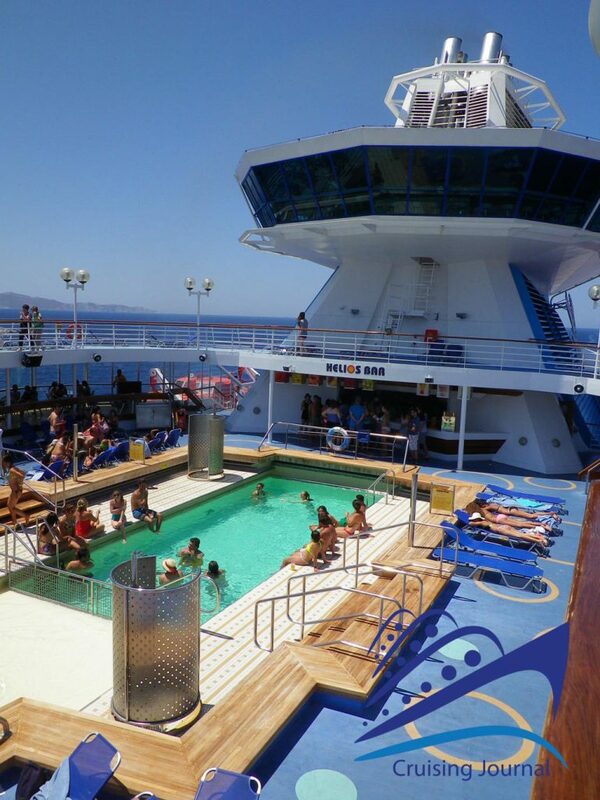 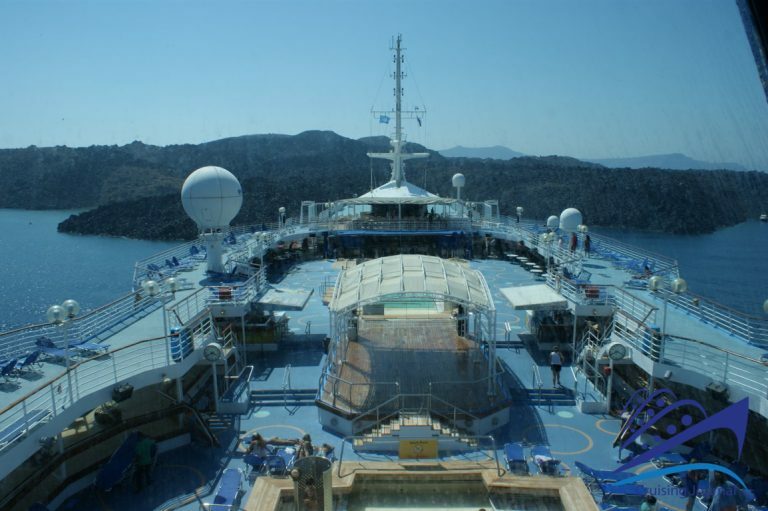 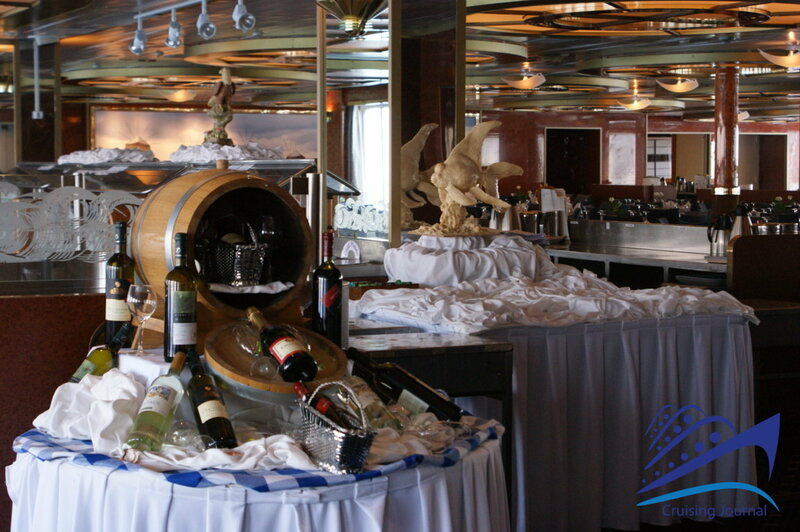 On Zeus deck 10, in the front of the ship, is the Thalassia Bar. 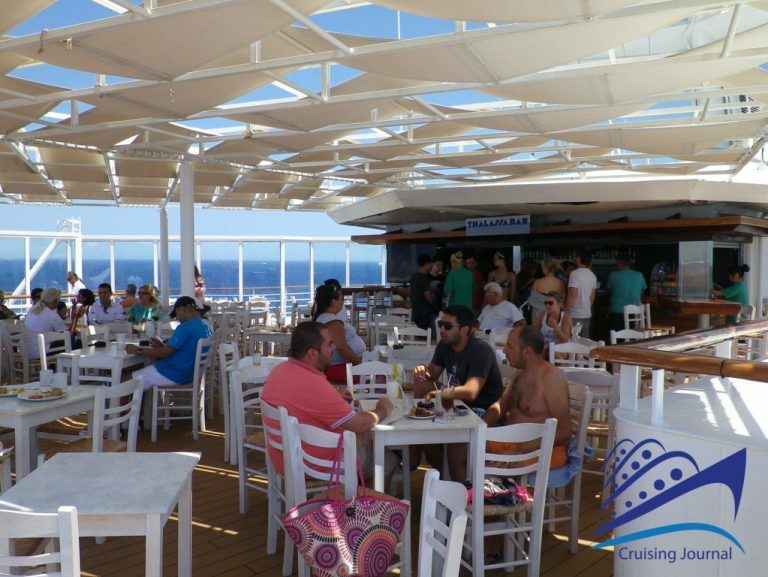 It is a very lively outside area, with Greek-style wooden tables and seats, and a view over the Lido. 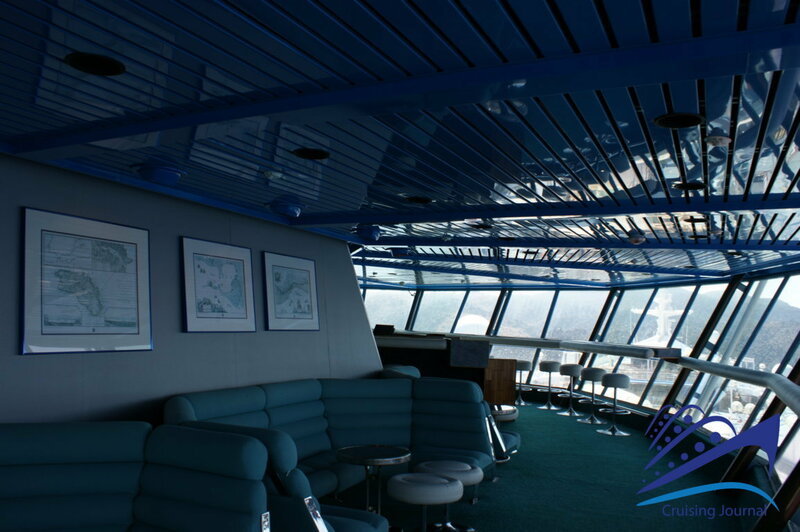 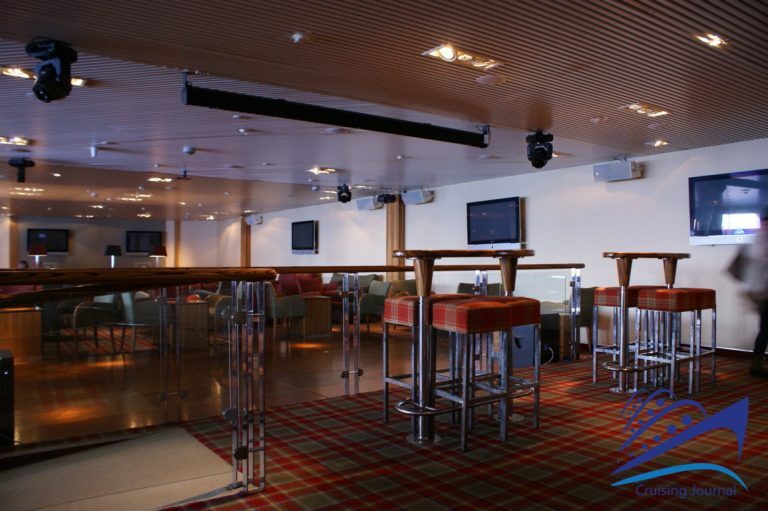 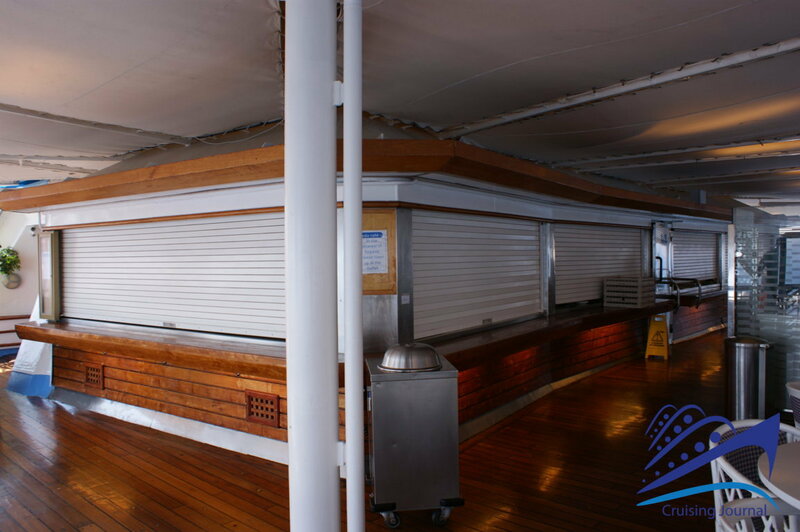 From the back of the bar it is possible to access an area at the bow that is open to passengers. 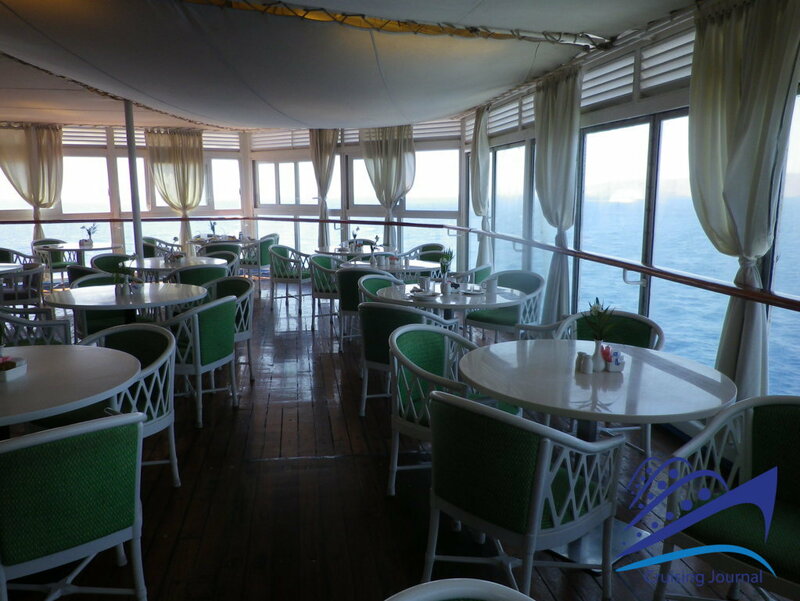 At the stern, besides the Leda Buffet, is the Horizon Bar, an outdoor space that does not have a bar or tables for sitting. 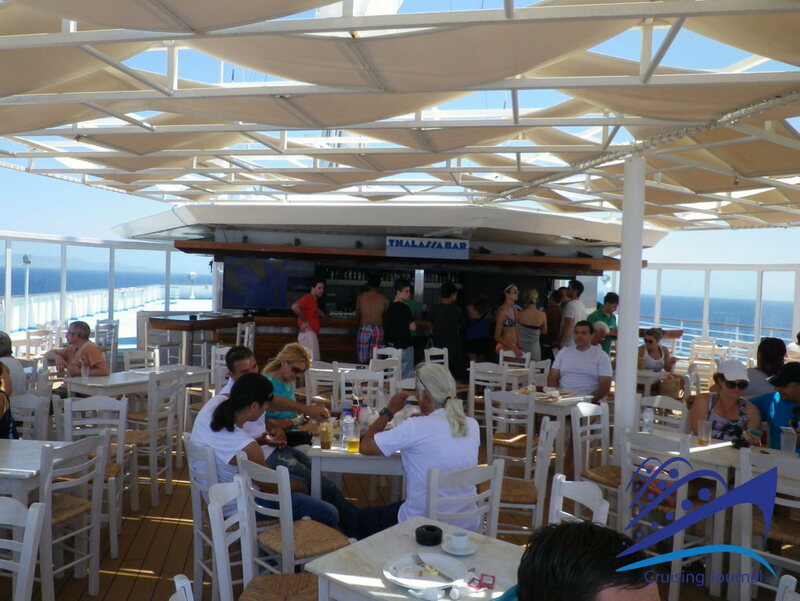 Instead, you can take your drink to the poolside sunbeds and tables. The two swimming pools are large and exceptionally deep (180cm). The areas are easy to use and in proportion to the number of passengers. 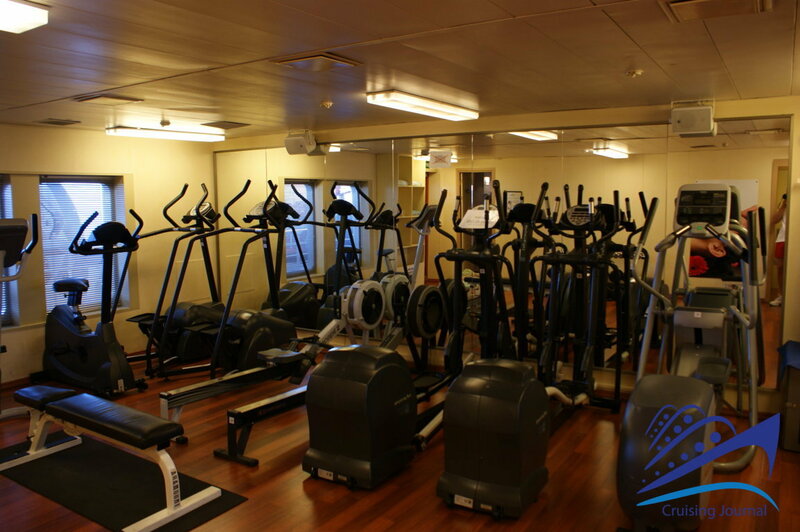 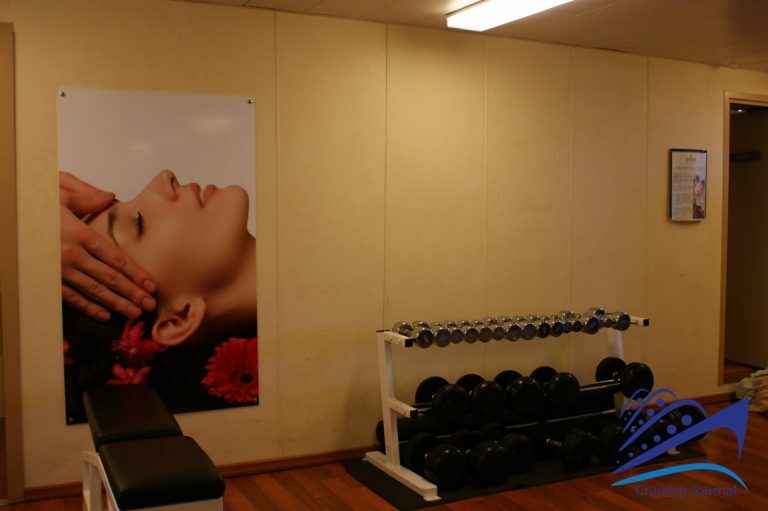 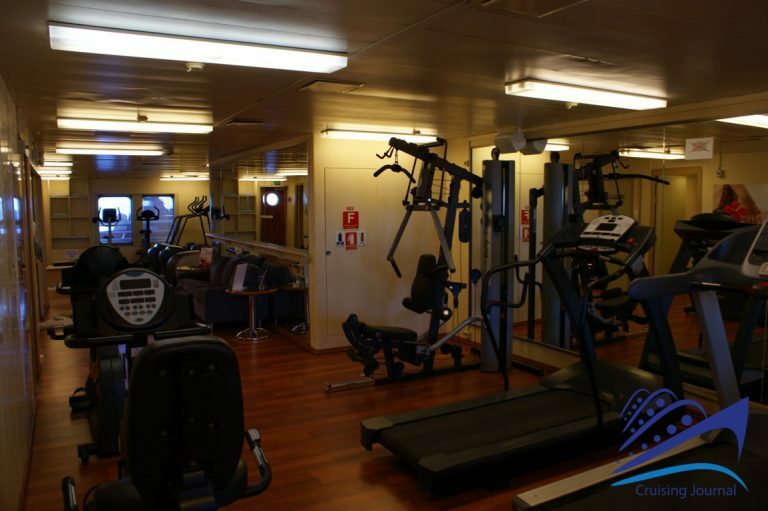 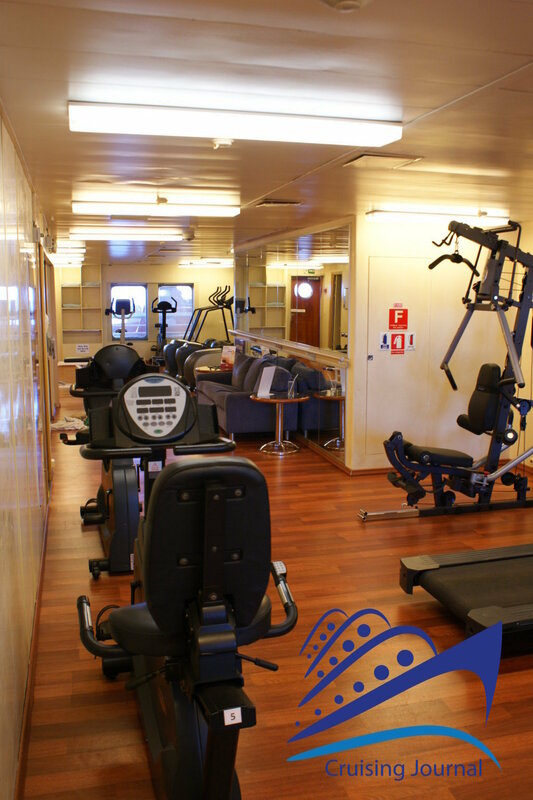 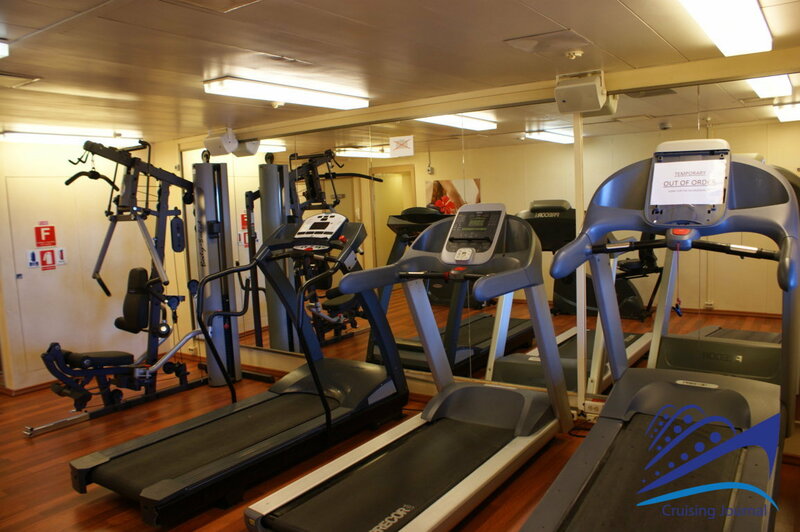 On Apollo deck 8 there is the gym, which is small and does not have very much equipment, and the sauna. 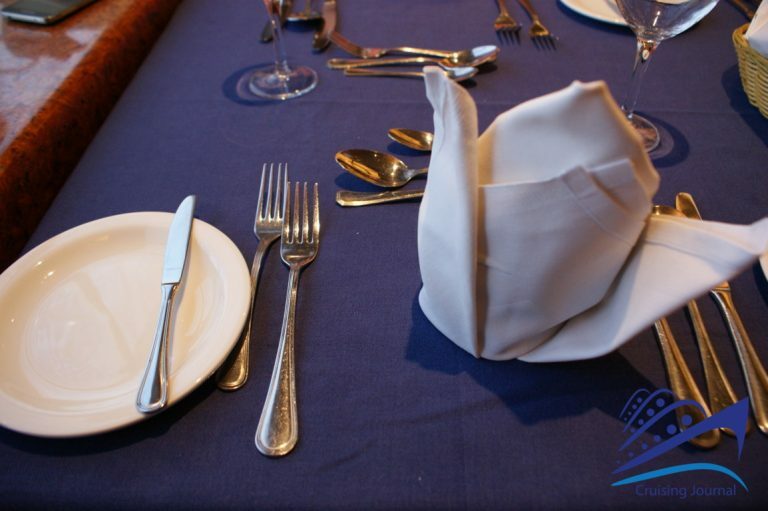 The first does not offer much equipment and covers a rather small surface area. On deck 7 there are cabins with bathtubs and views obstructed by the lifeboats. 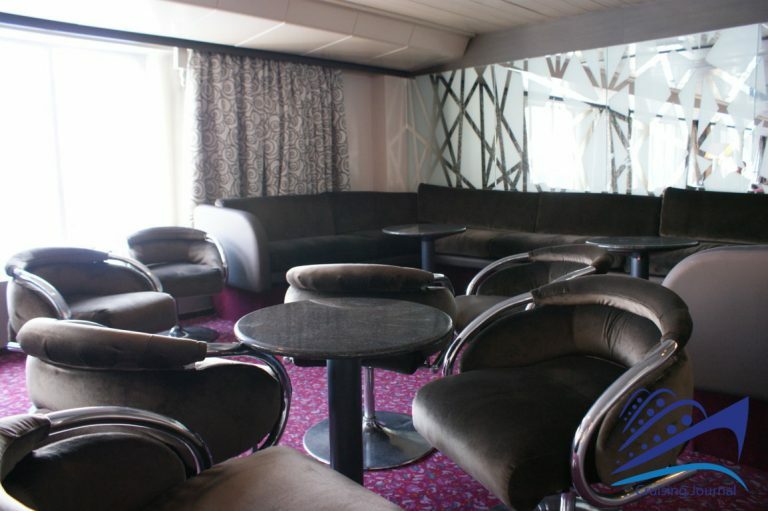 In the central part of the boat you will find the Kid’s Club and the Eclipse Bar, an area with slightly retro décor where live music events are held. Externally there is a beautiful walkway on both sides of the ship. 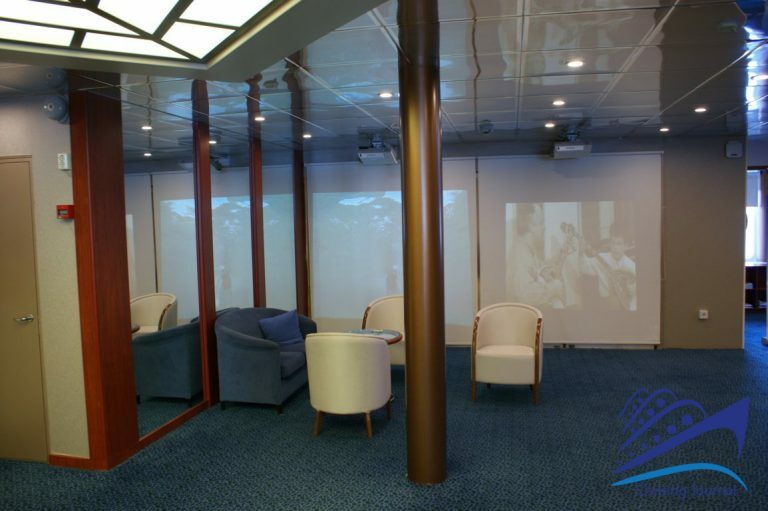 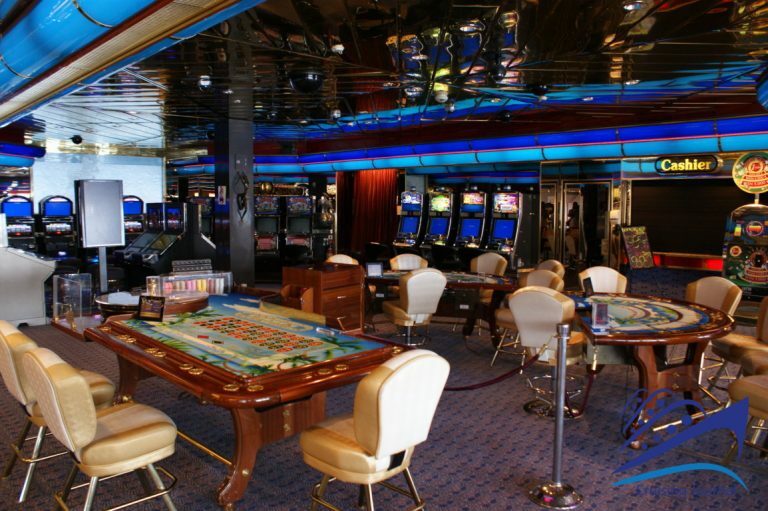 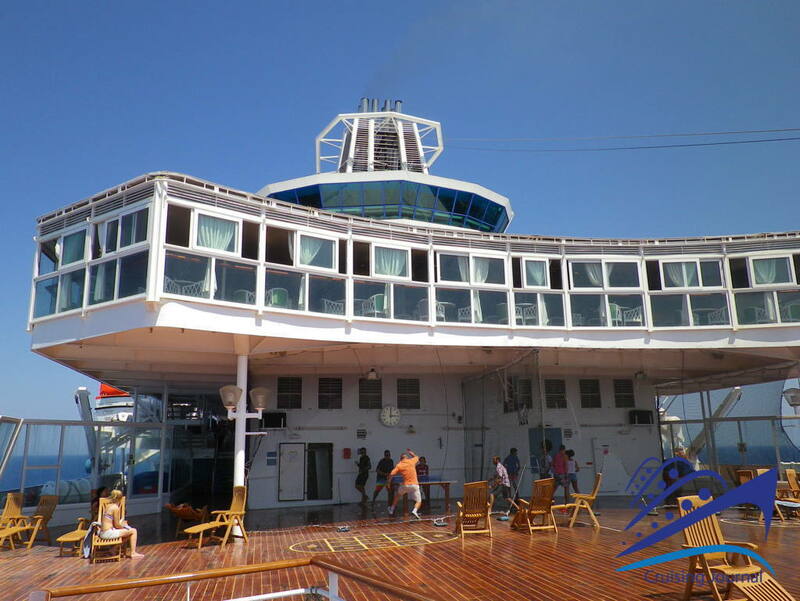 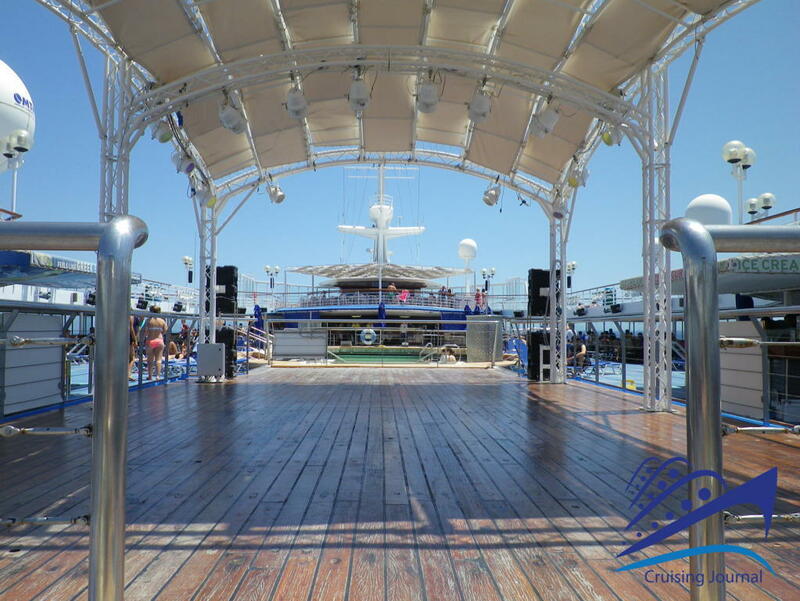 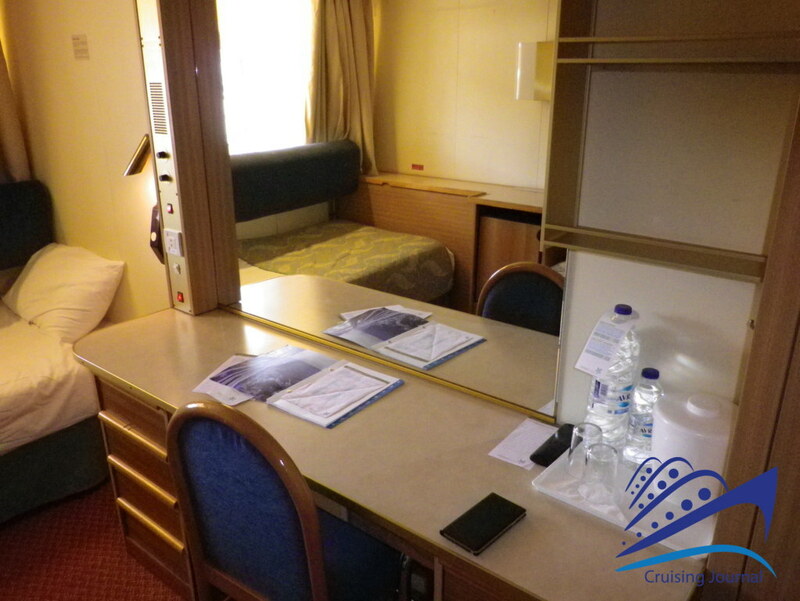 On Venus deck 6 there are only cabins, both internal and external, in the bow area. 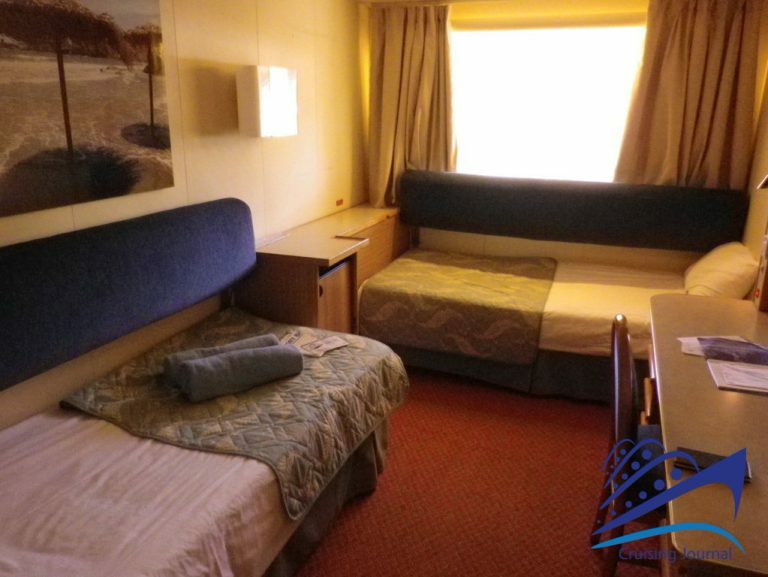 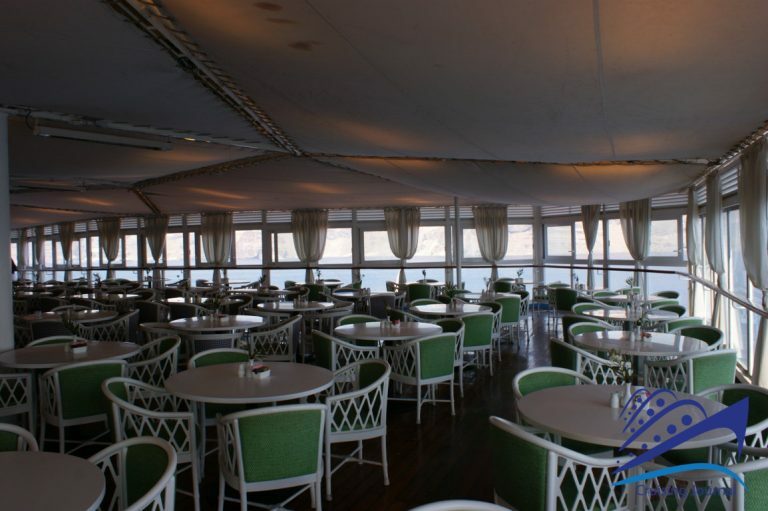 On Dionyssos deck 5 there are more cabins in the front and a series of special rooms in the central area and the back of the ship. 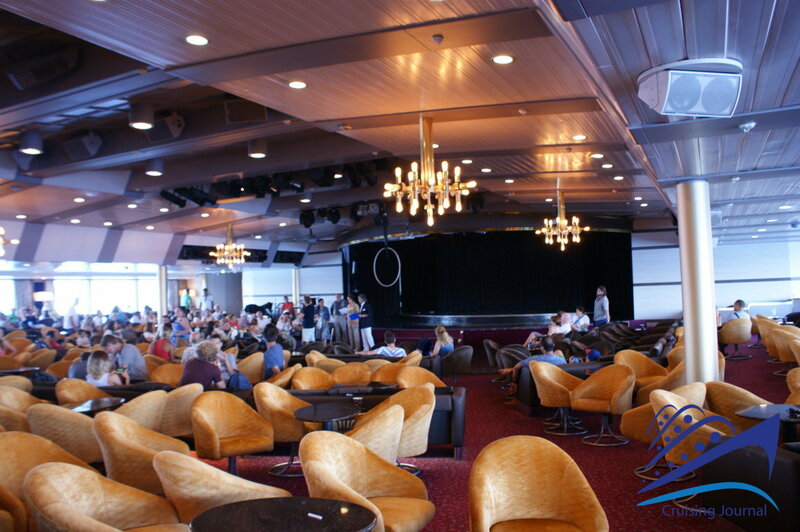 At the center there is the Muses Lounge, a large hall that in the evenings is transformed into a theater with Greek folklore or variety shows. 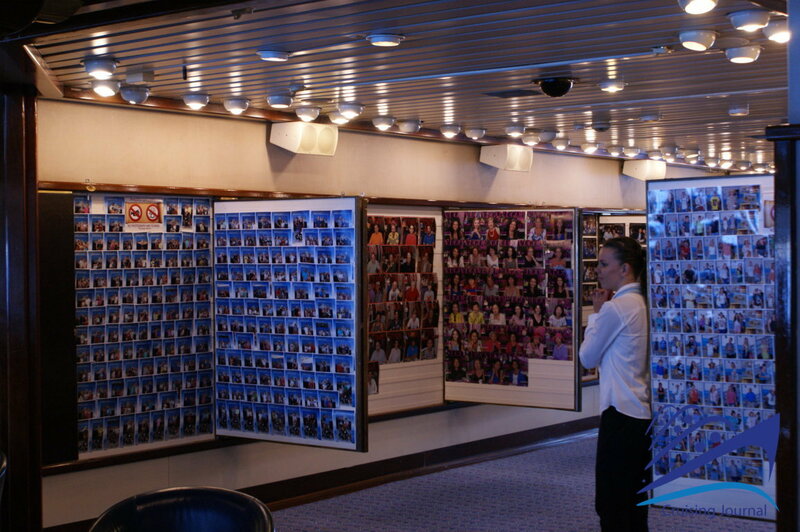 Then follows the Photo Gallery and the Casino. 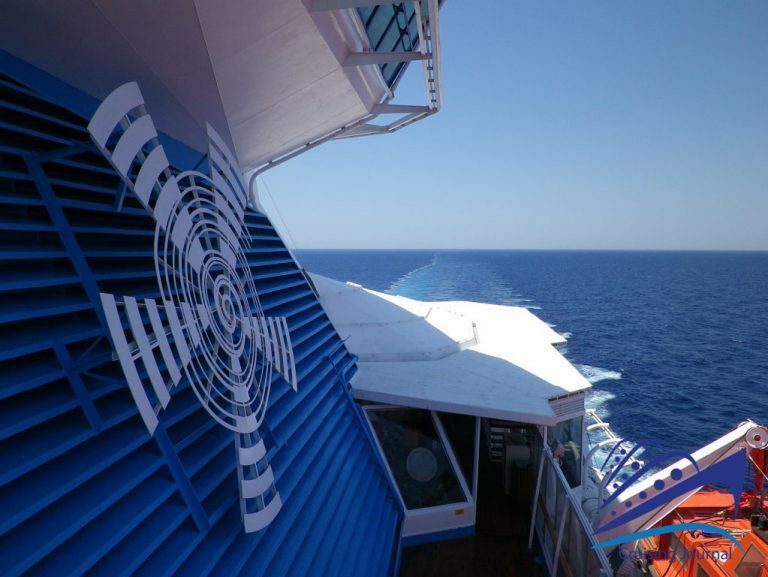 The first is really small and crosses the ship from right to left. 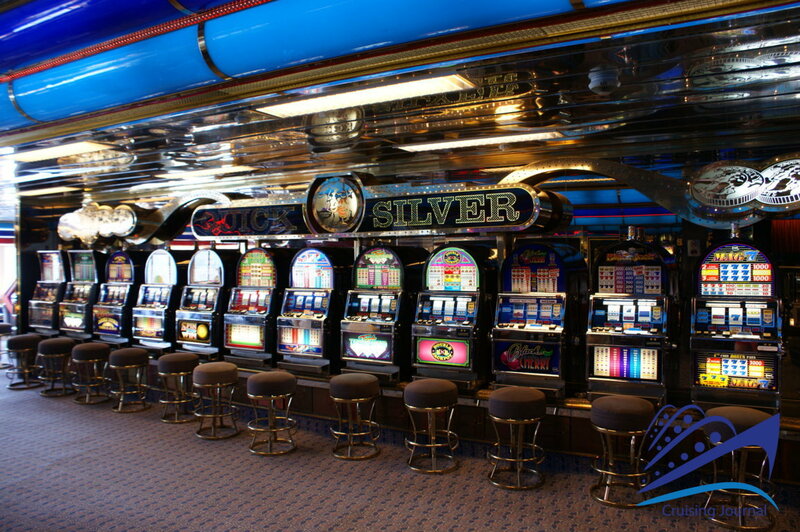 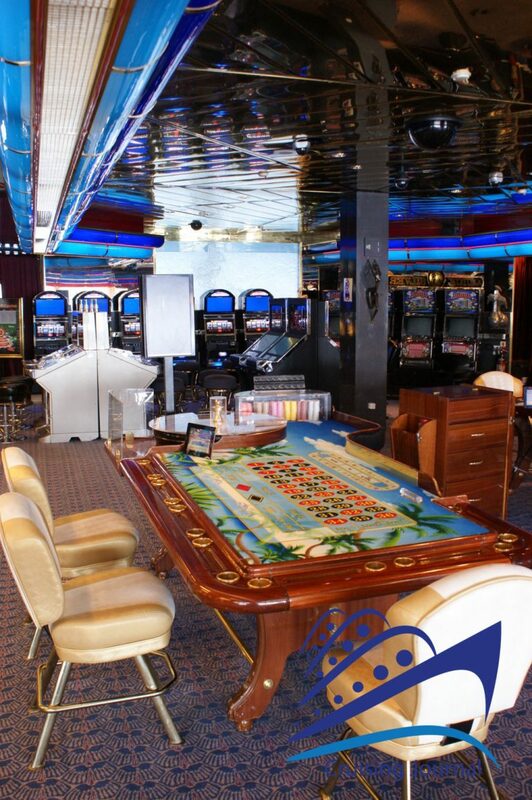 The Casino is also small but very well maintained. 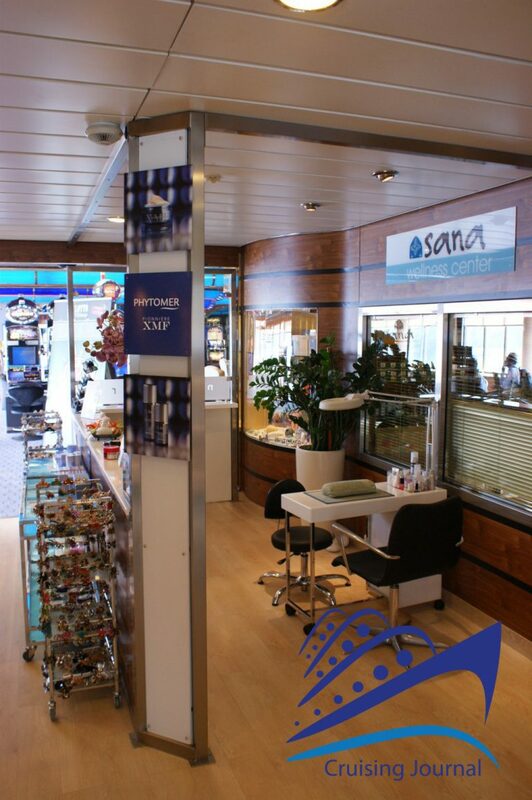 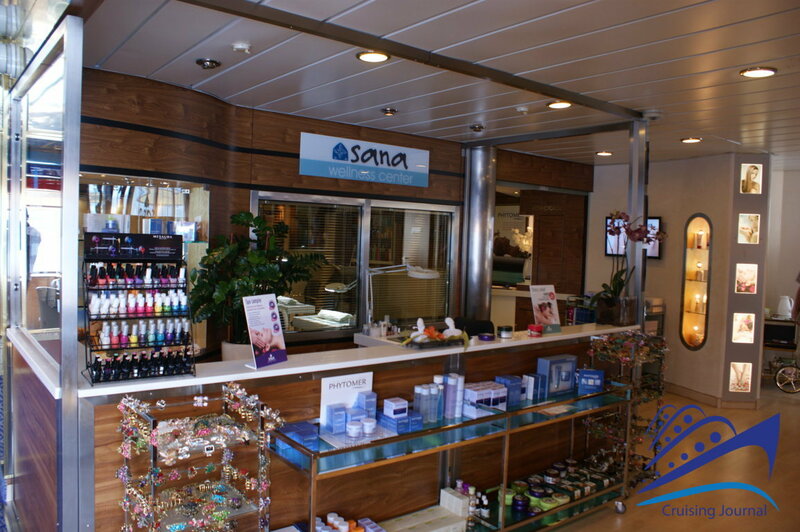 Continuing on you will encounter Bar Argo, on the right side of the ship, and the Sana Beauty Center, on the left side of the ship. 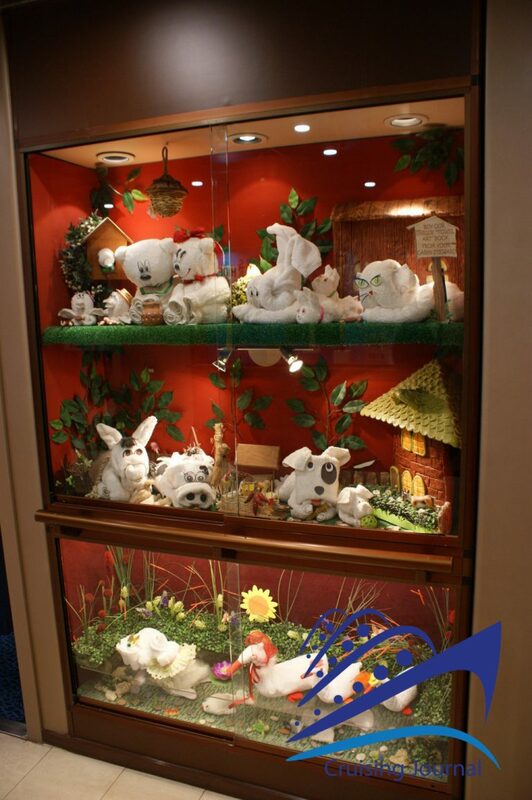 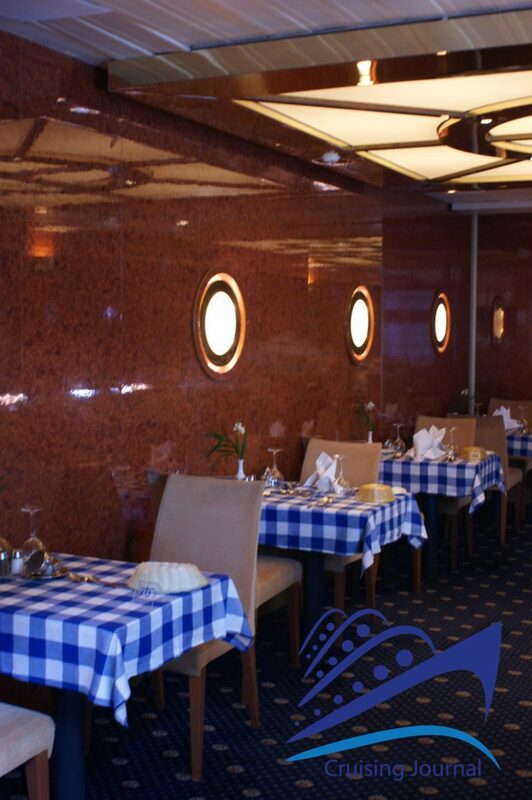 The first is decorated in nautical style, very lively and characteristic. 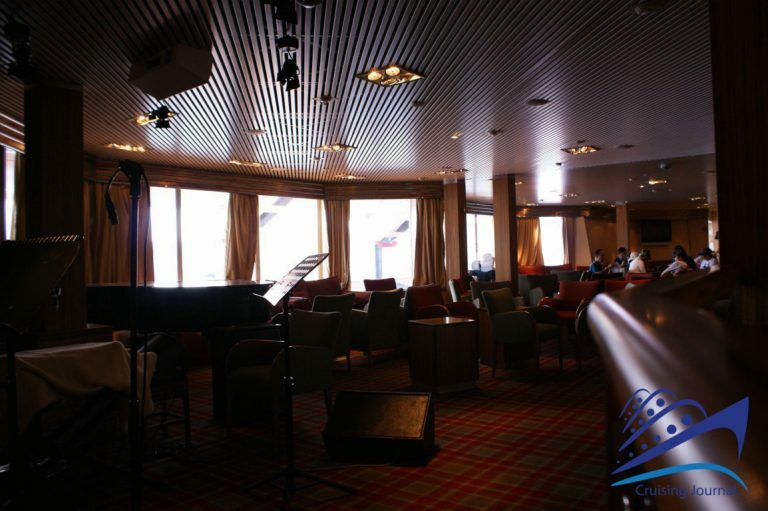 Two corridors then lead to the Selene Lounge, another very large area that is used as a bar during the day and transforms into a dance club at night. 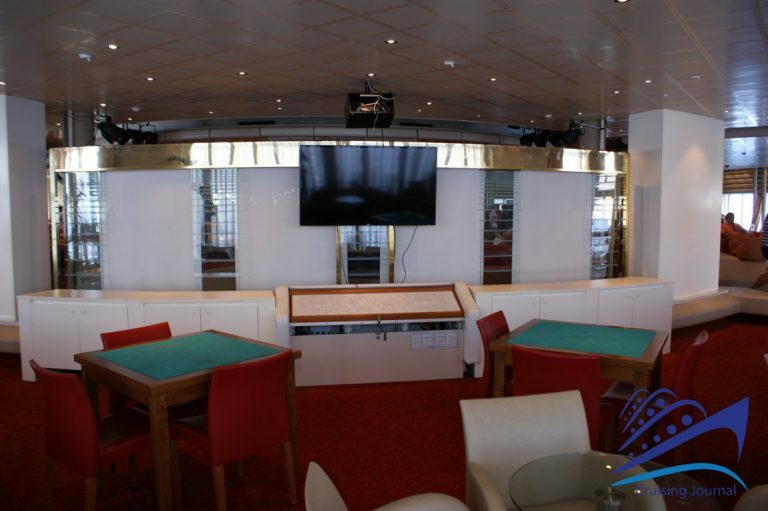 In the back some tables and a large screen create a card and TV room. 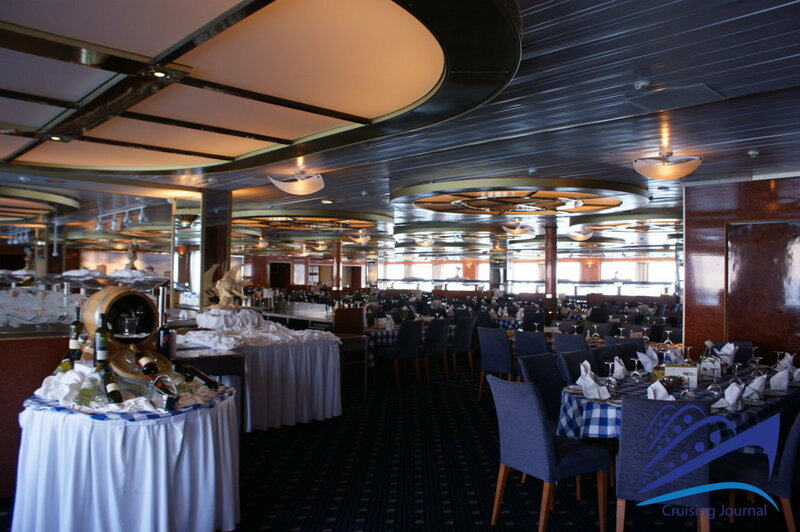 Poseidon deck 4 has the restaurant Aegean in the front of the ship. 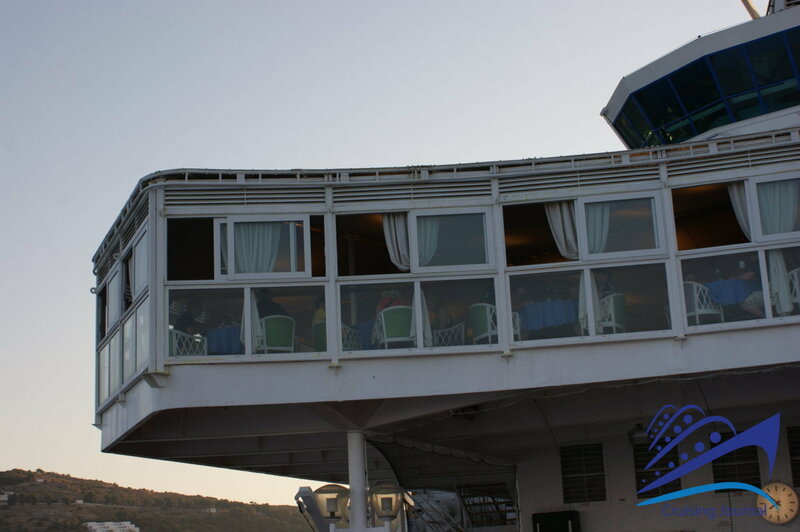 In the center of the ship are some shops, the Internet Café, the Reception, the Excursion Office, and the very small library. 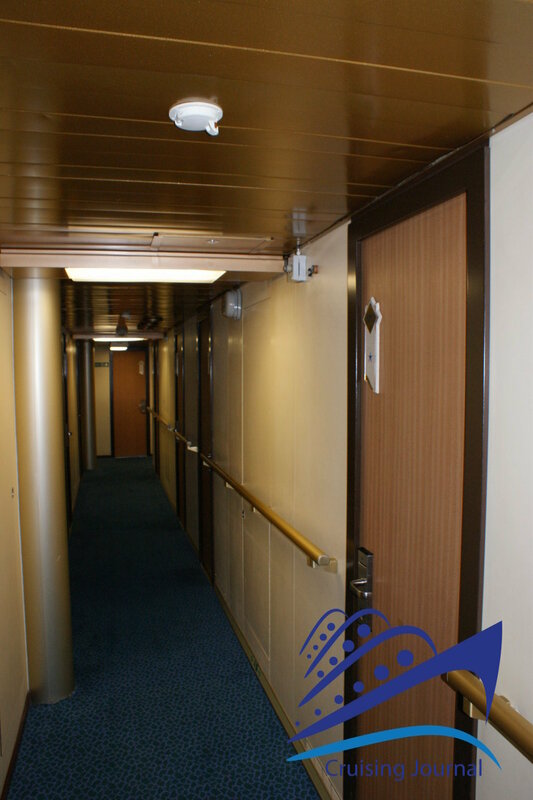 In the back of the ship are more internal and external cabins. 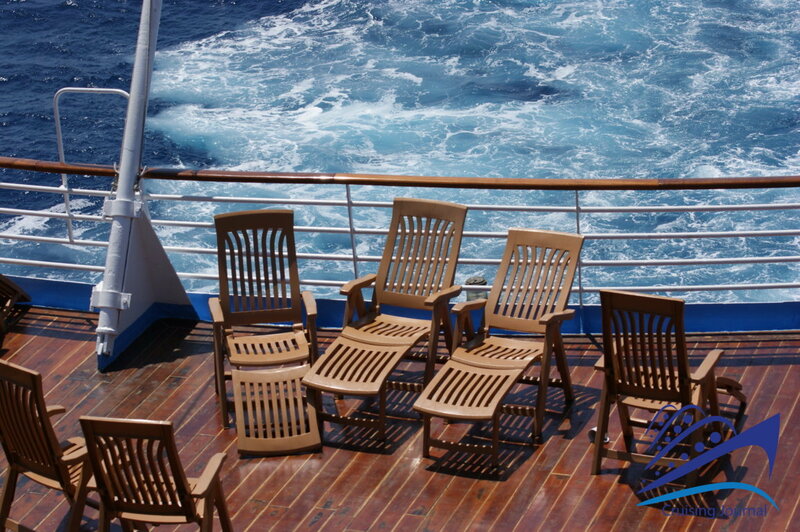 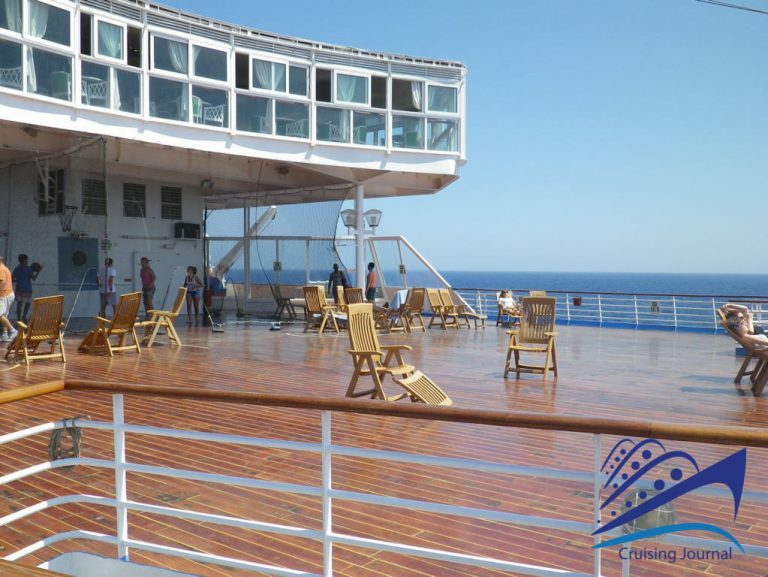 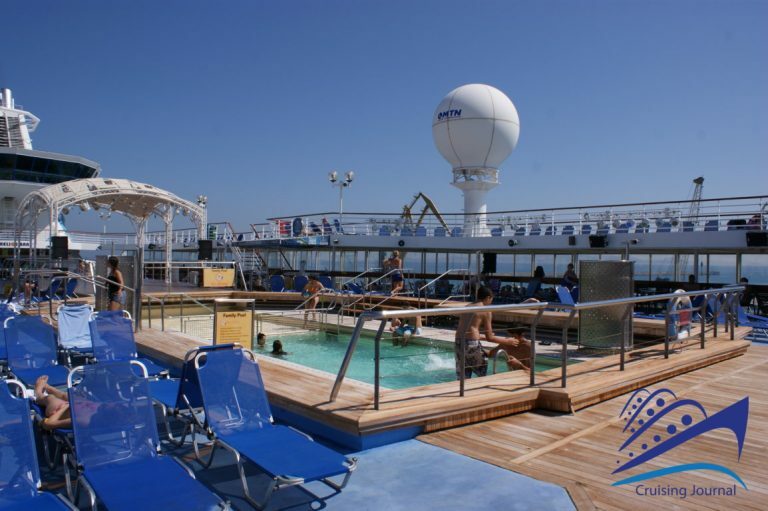 Deck 2 and 3 are entirely dedicated to cabins. Deck 1 houses the gangway and the medical center. 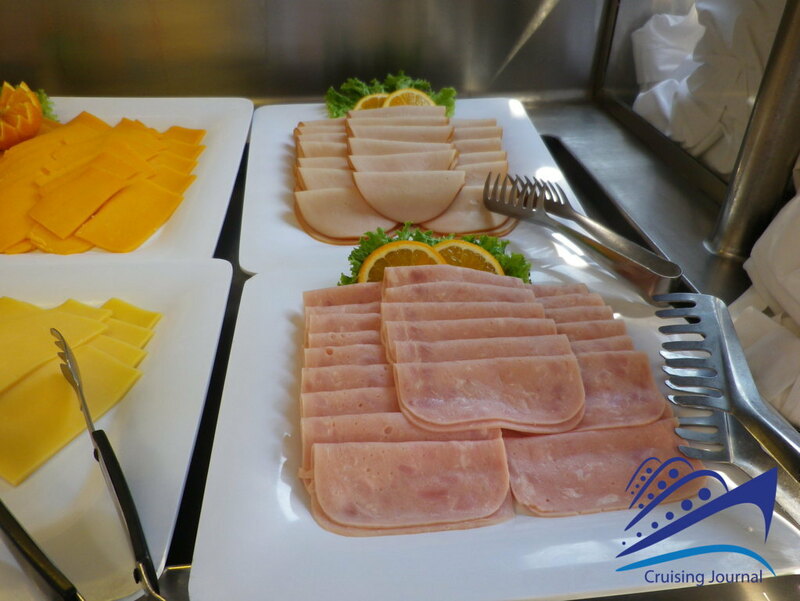 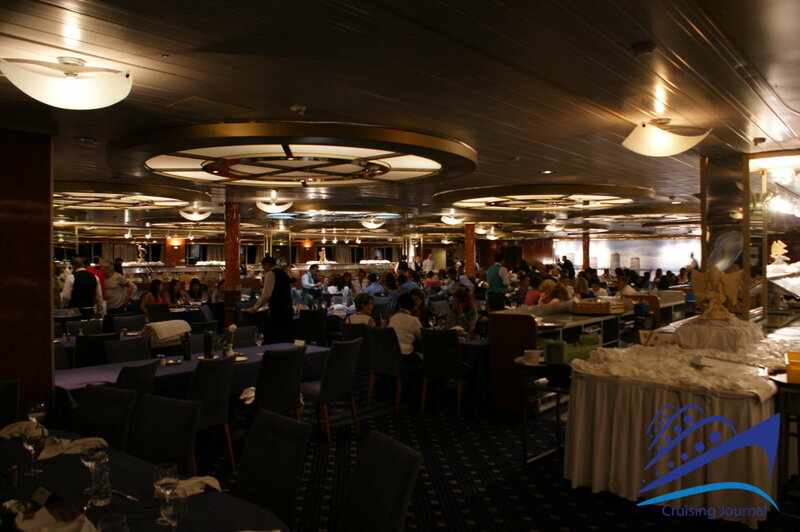 On board dining is offered in three different locations. 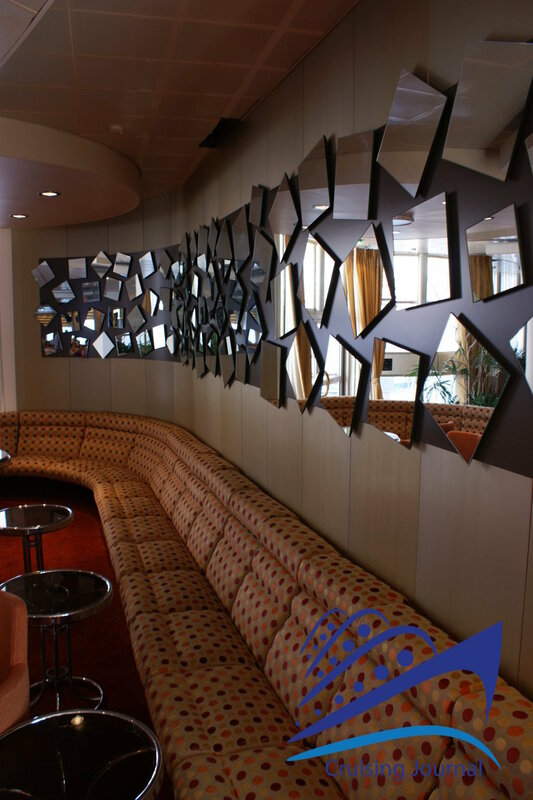 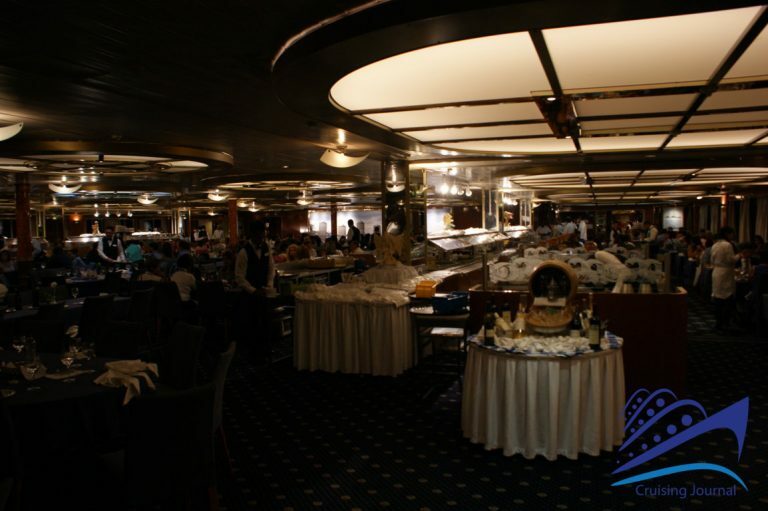 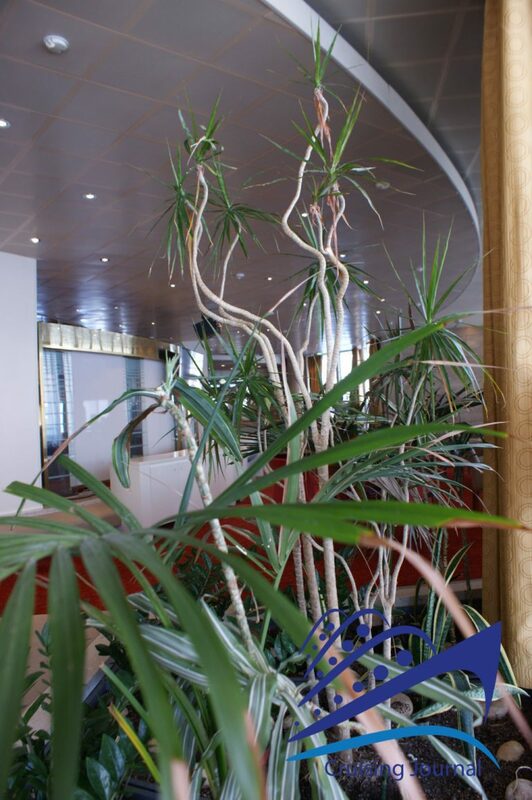 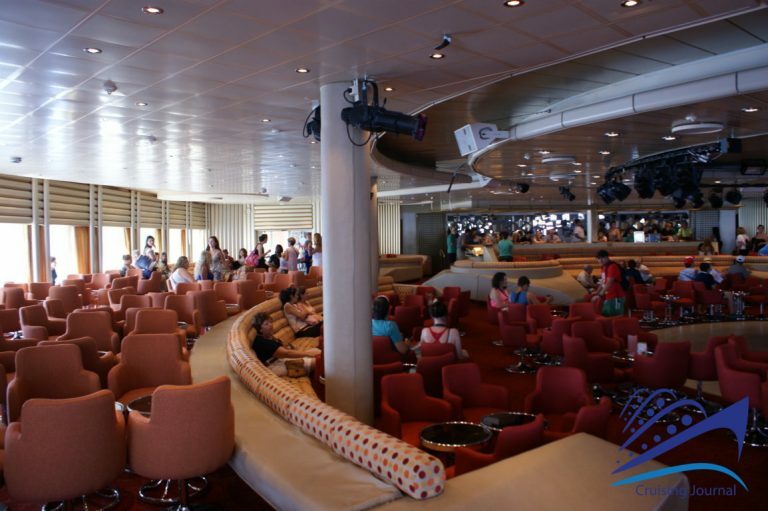 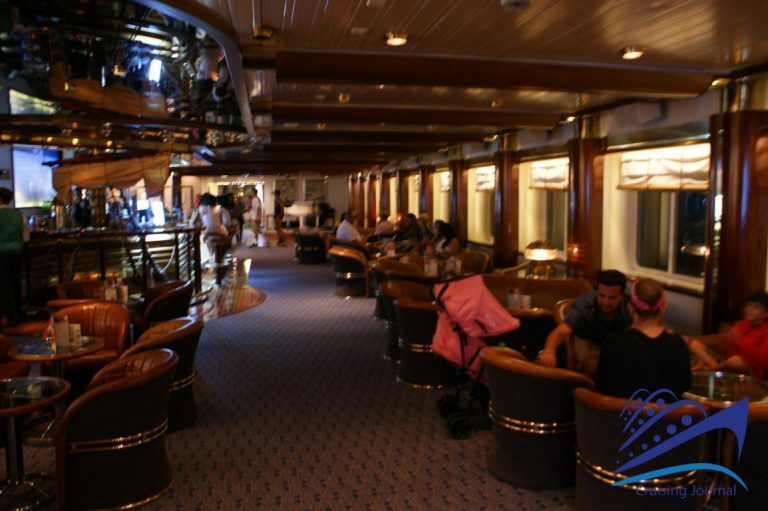 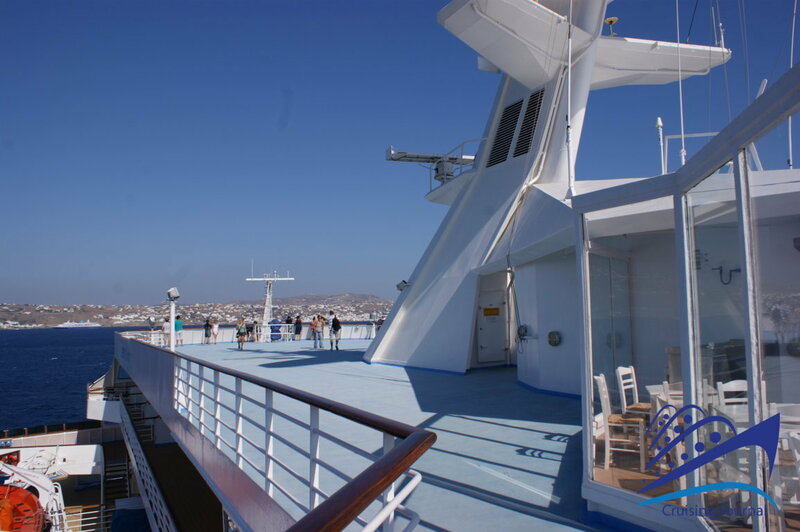 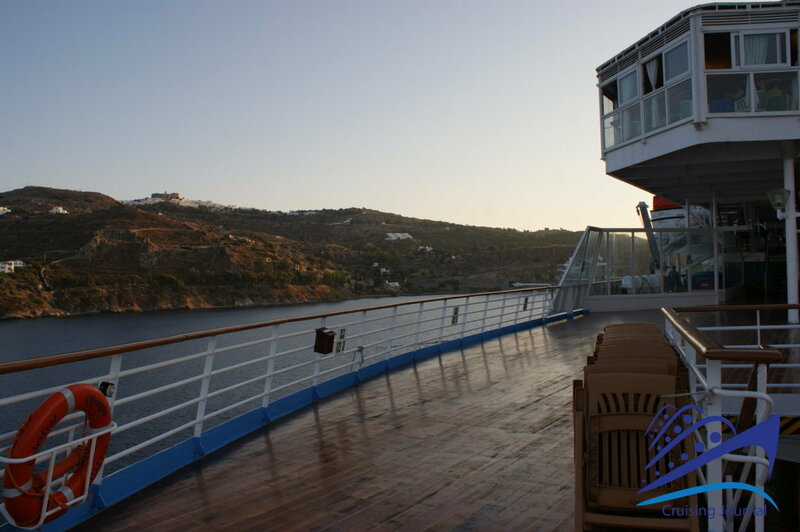 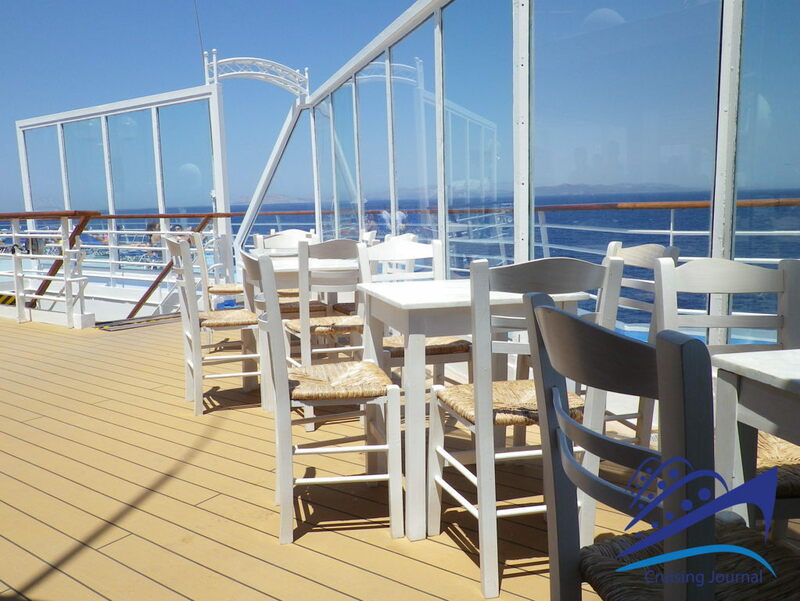 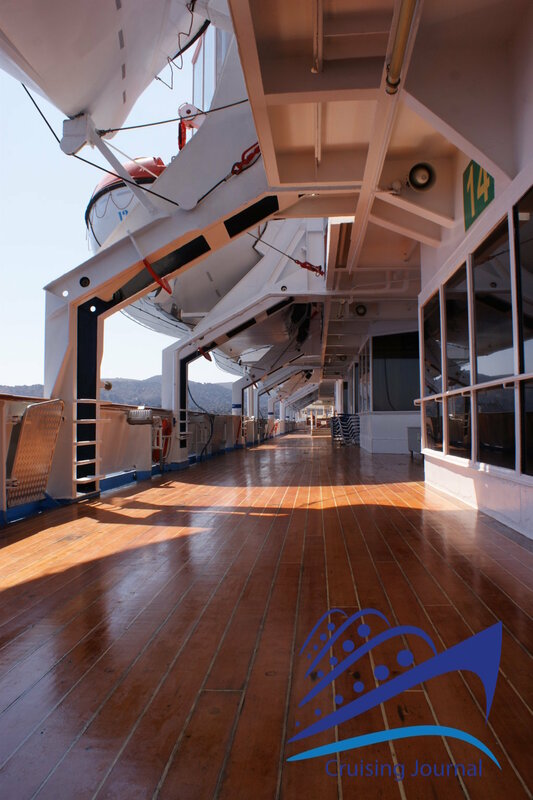 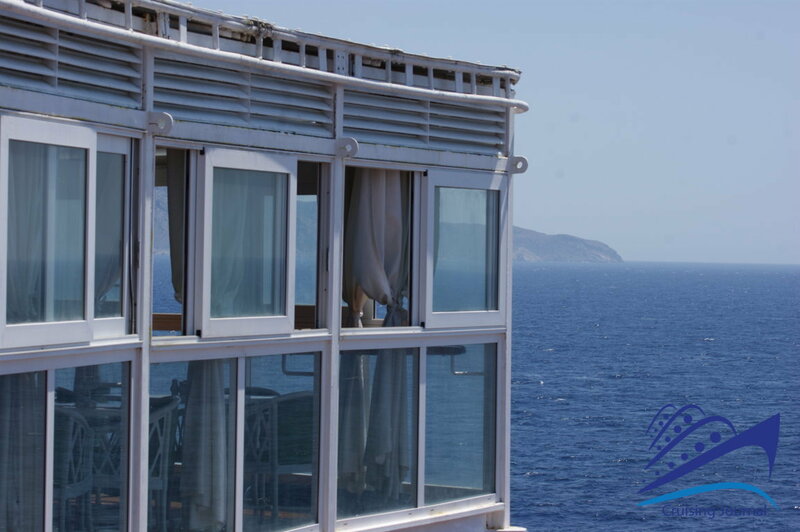 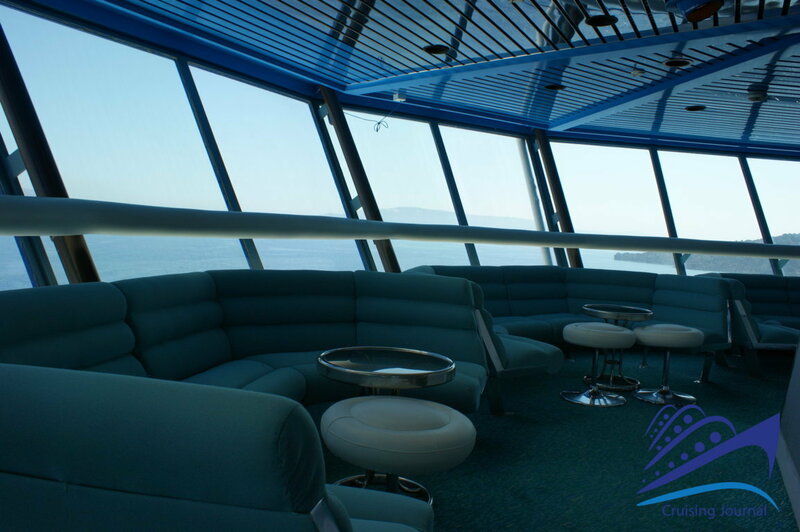 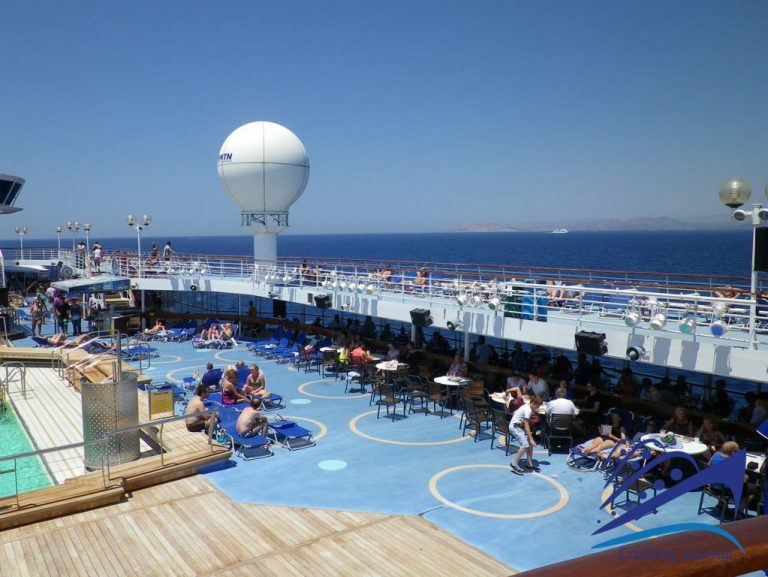 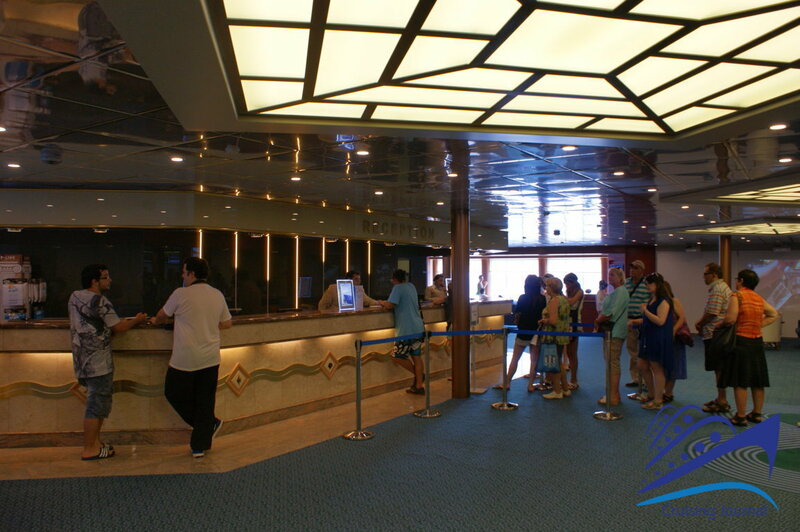 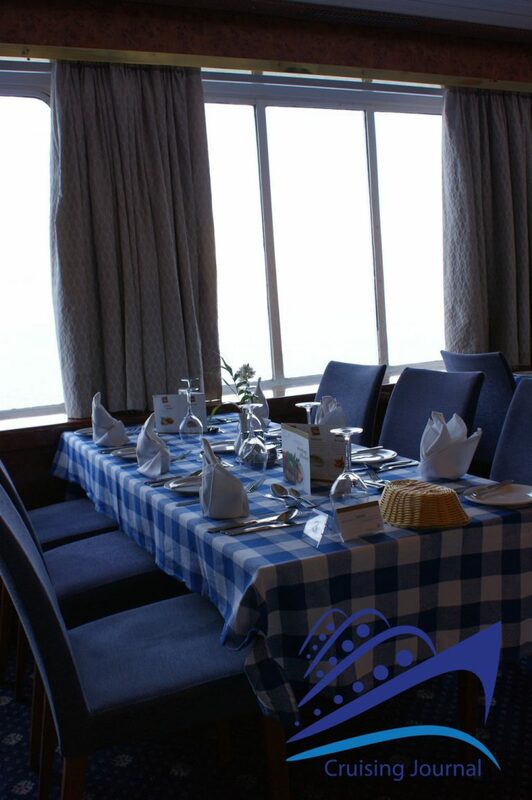 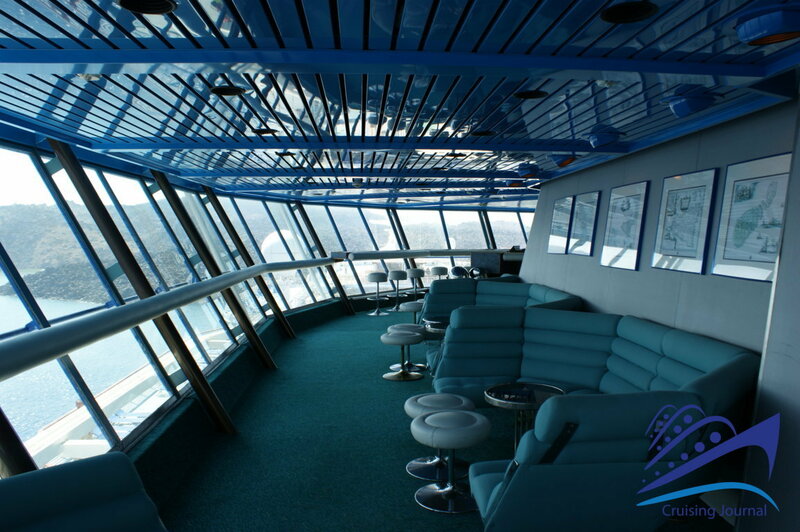 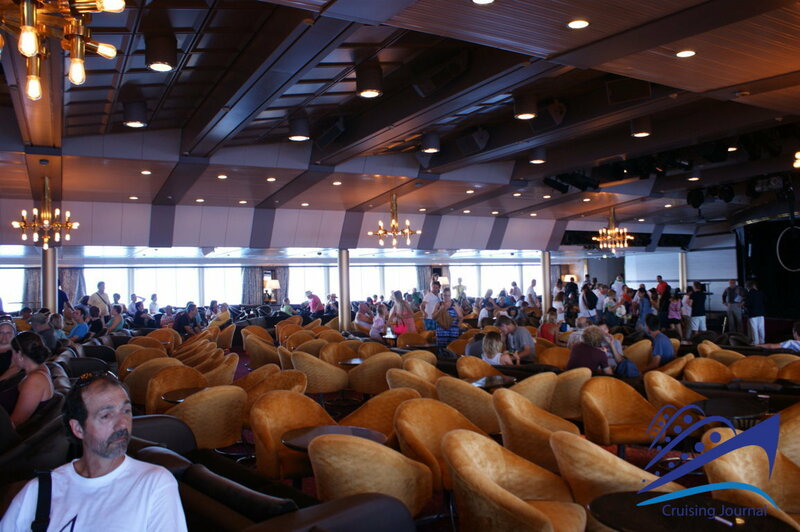 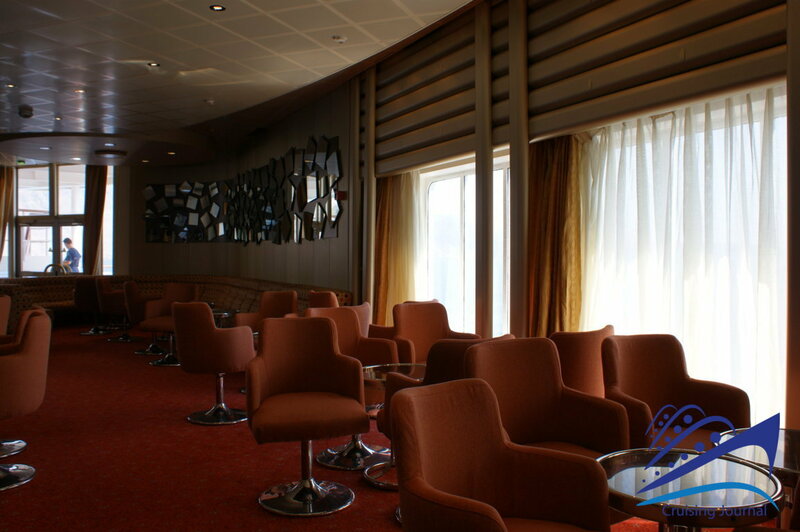 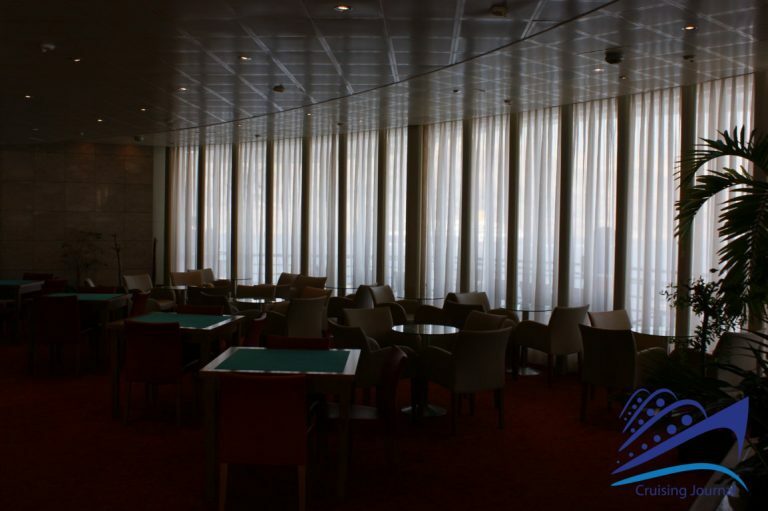 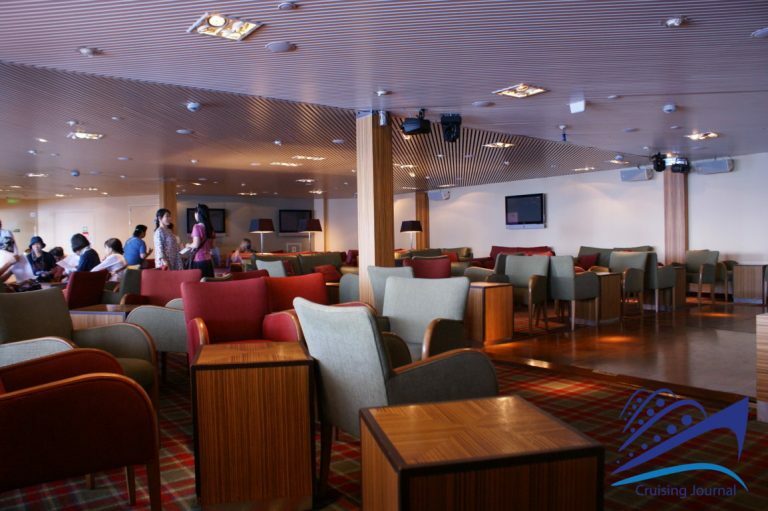 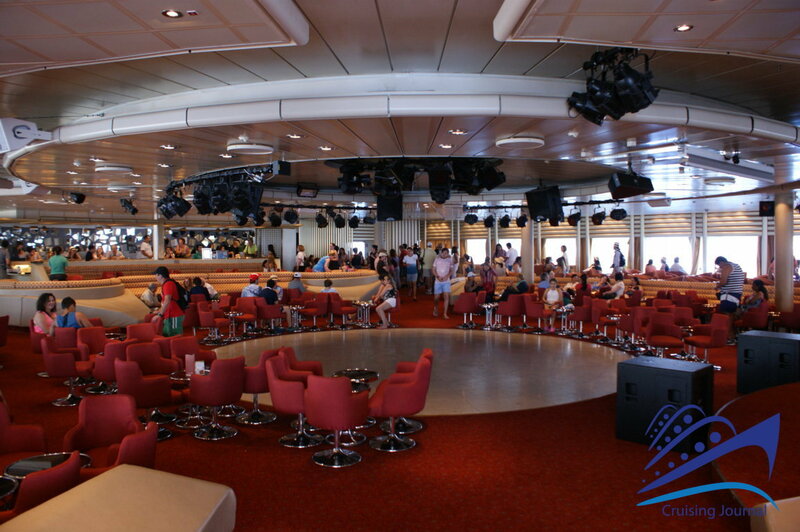 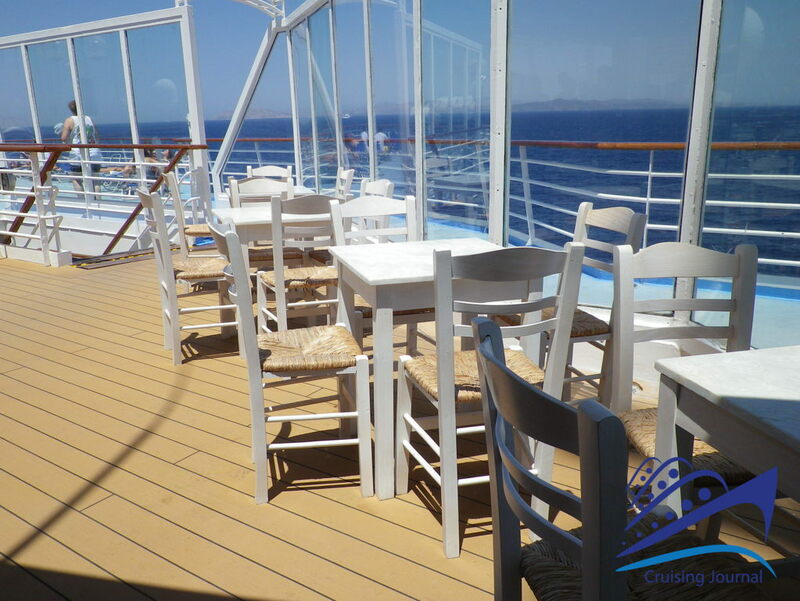 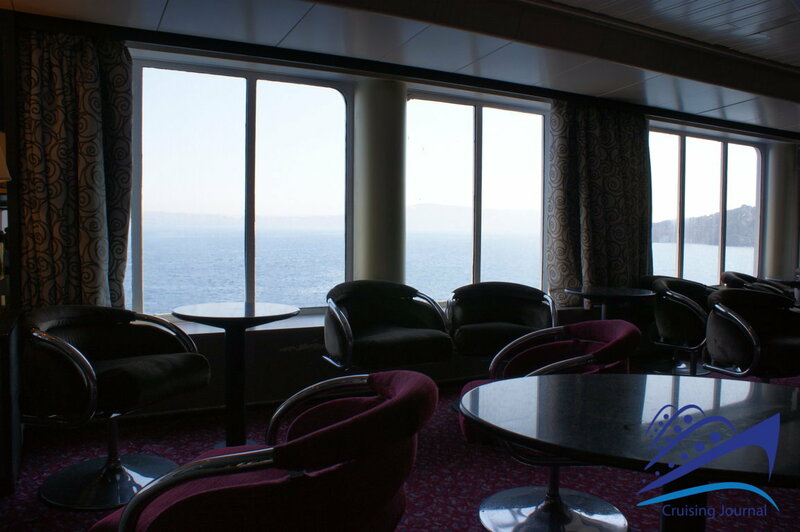 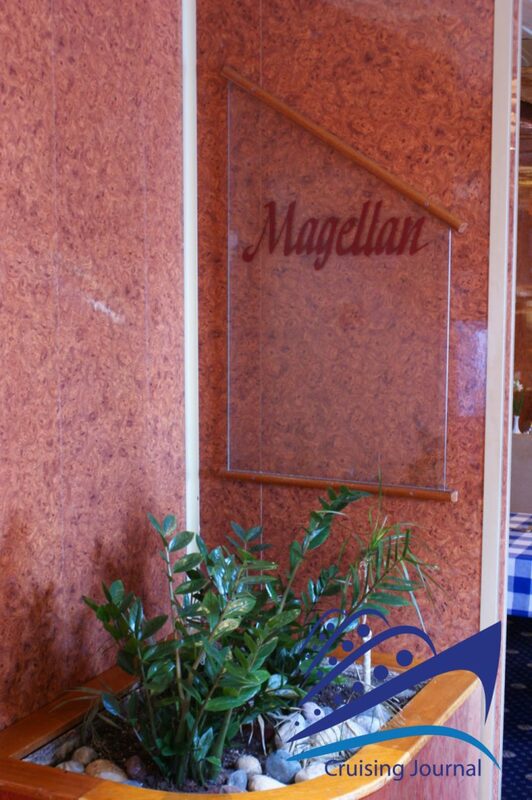 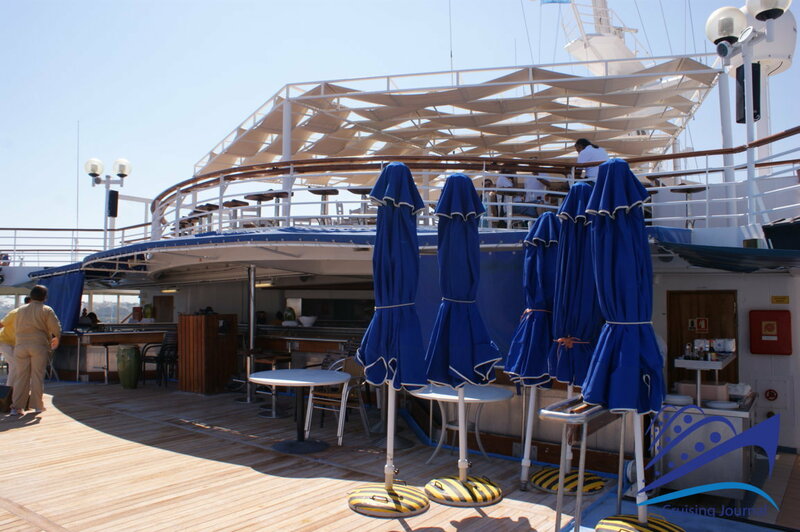 The main restaurant Aegean, with open seating and à la carte service, is located on Poseidon deck 4. 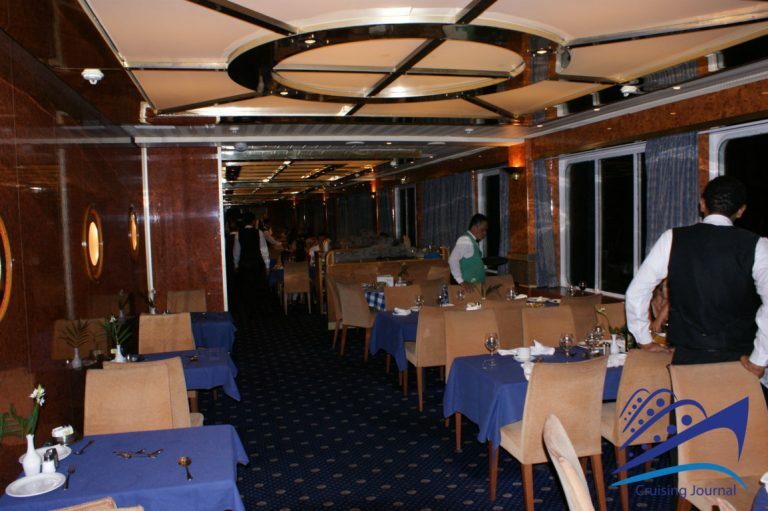 It is very large and has two central buffet lines for breakfast. 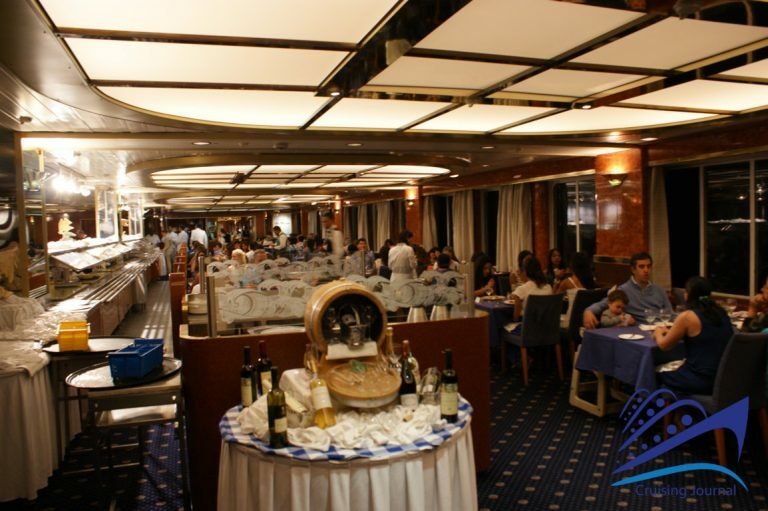 It offers lunch and dinner with à la carte menu that features Greek specialties. 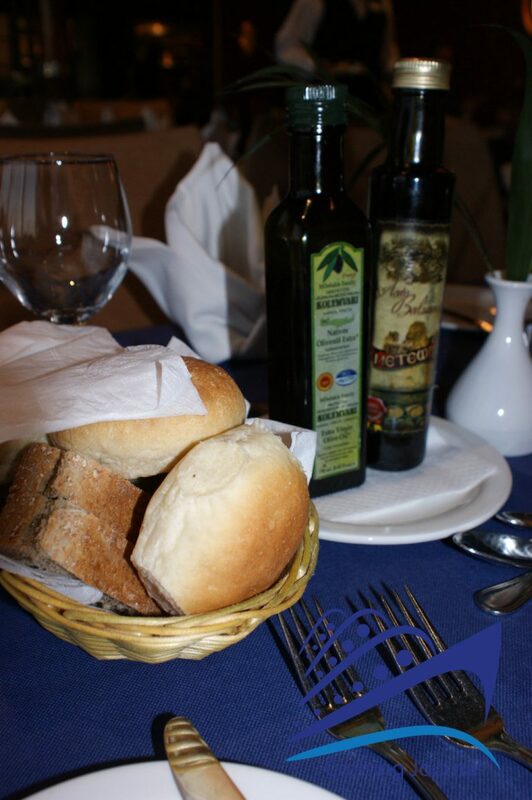 The table setting is simple and reflects that of a Greek tavern. 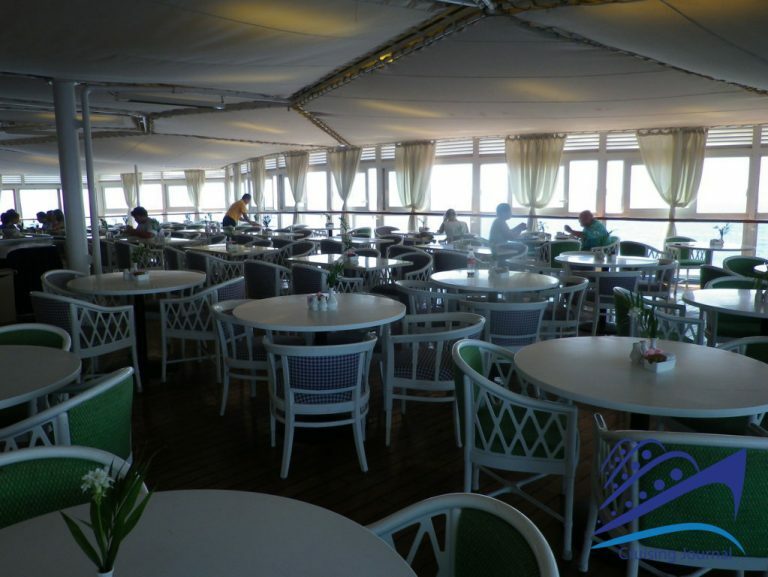 There are only 10 tables for just two people, while the other tables are shared, meaning diners are seated together with fellow passengers. 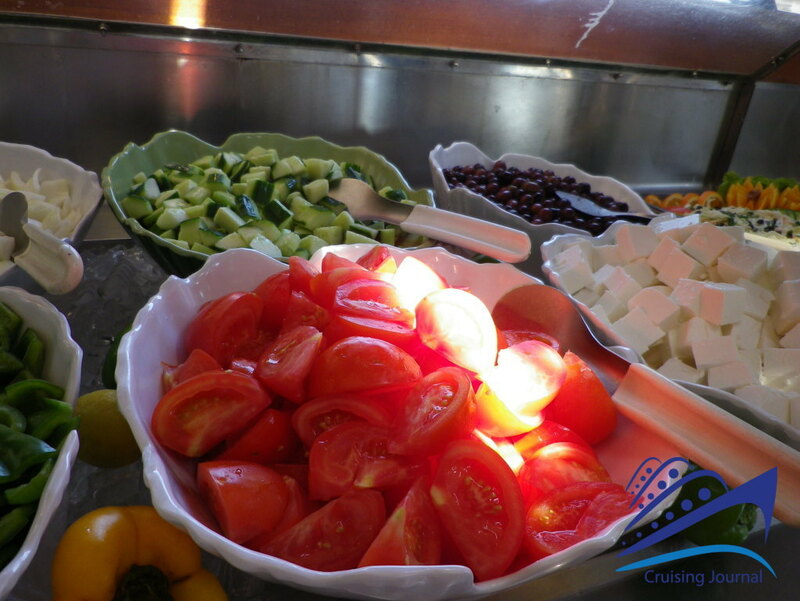 The dishes are based mainly on recipes from Greek and Mediterranean cuisine. The alternative restaurant is the buffet style Leda Casual Dining. 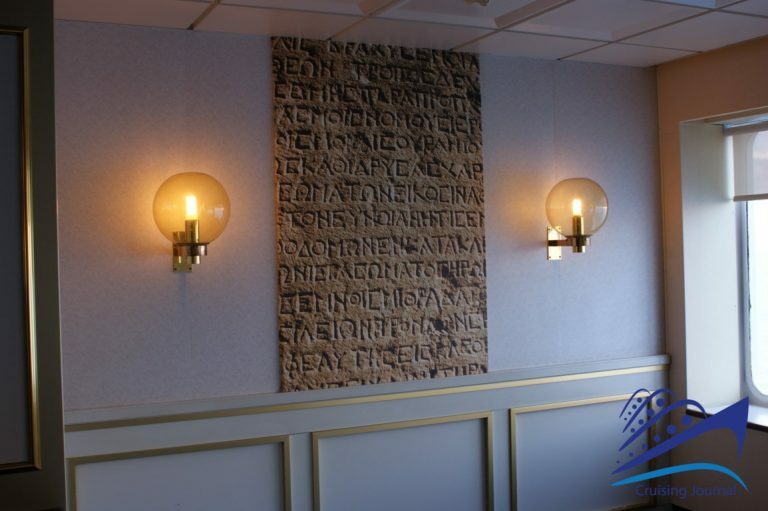 It is located on Hera deck 9 at the back of the ship. 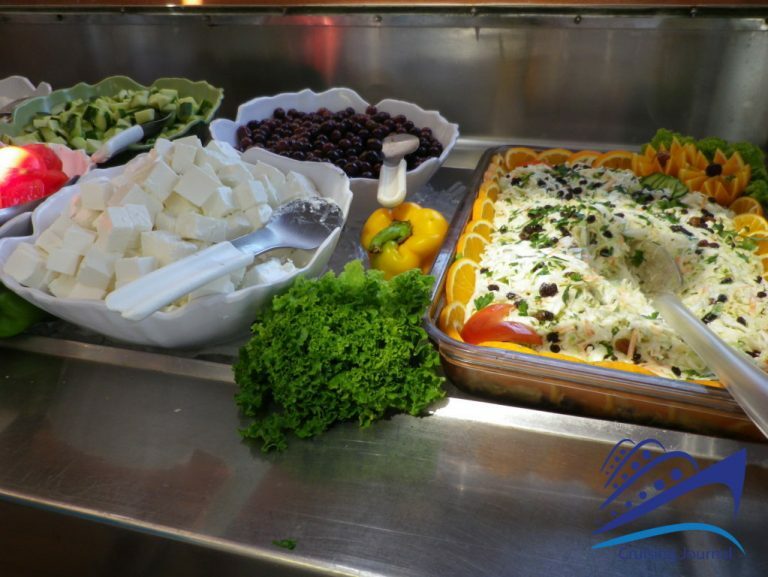 The style is very simple and essential without much variety, and choices include: various types of salads, main courses including fish, soups, fruit, various pates and cold pasta. 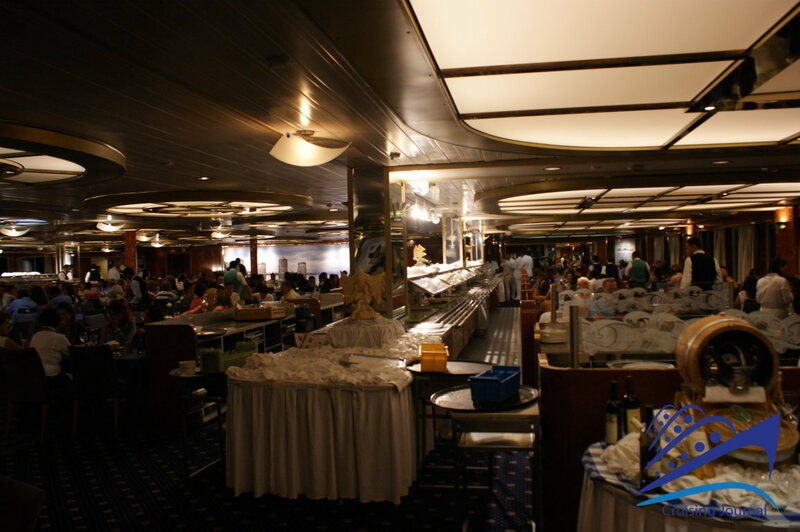 In one corner there is a small kitchen where quick first course dishes are prepared. 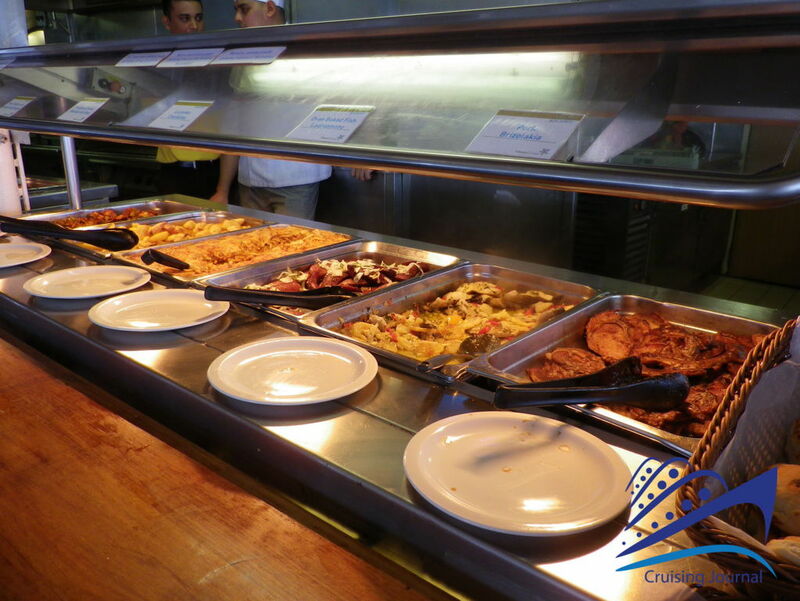 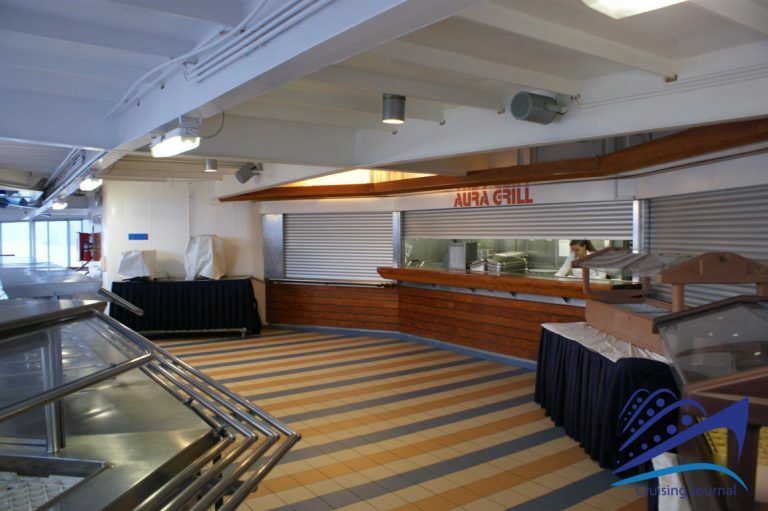 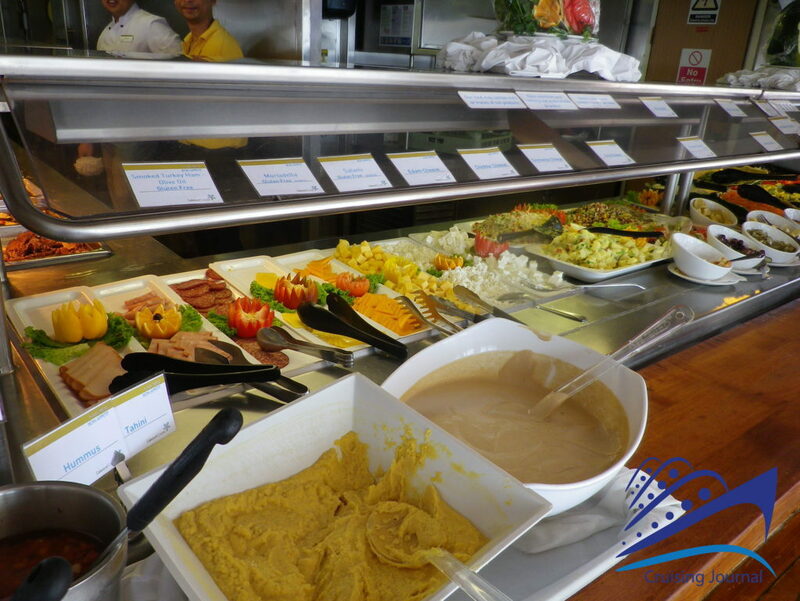 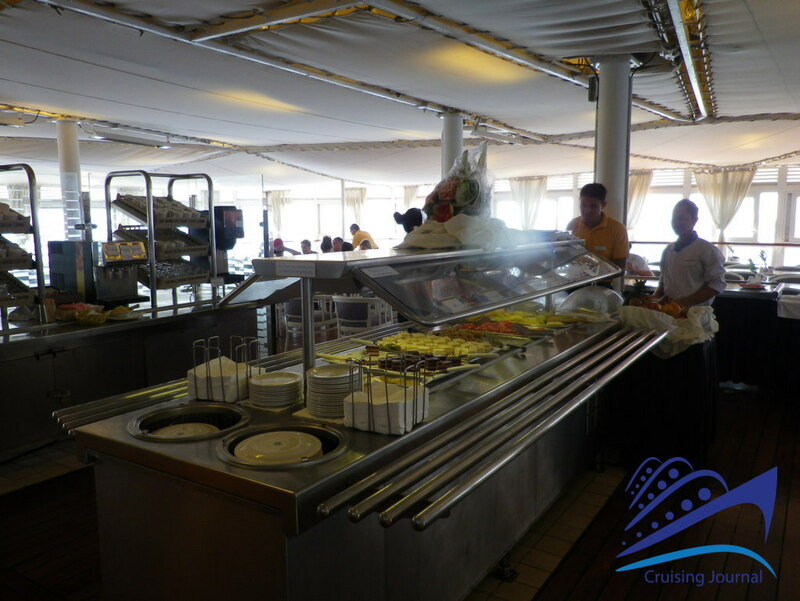 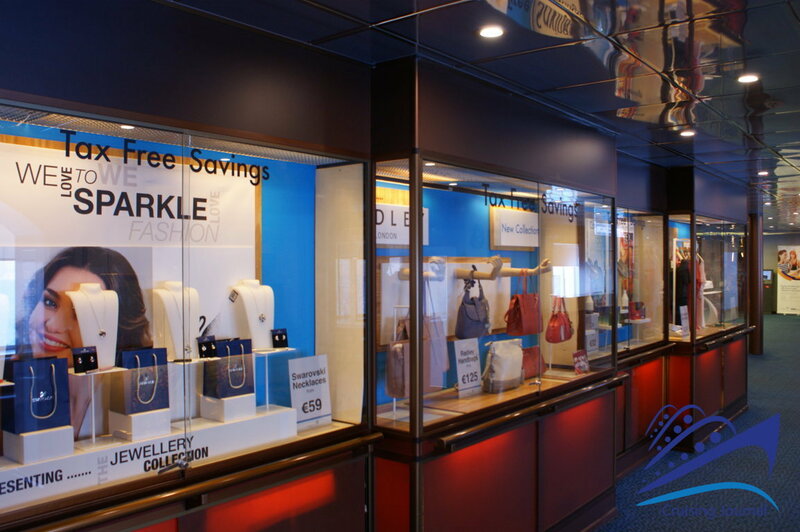 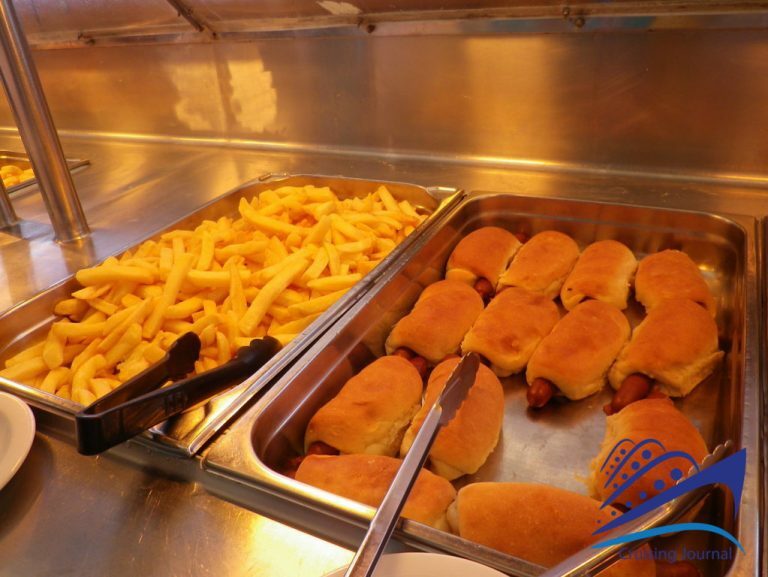 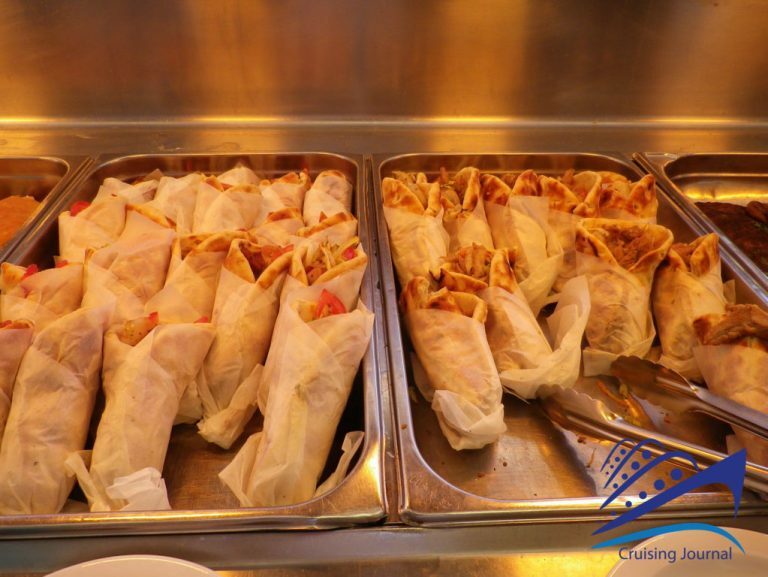 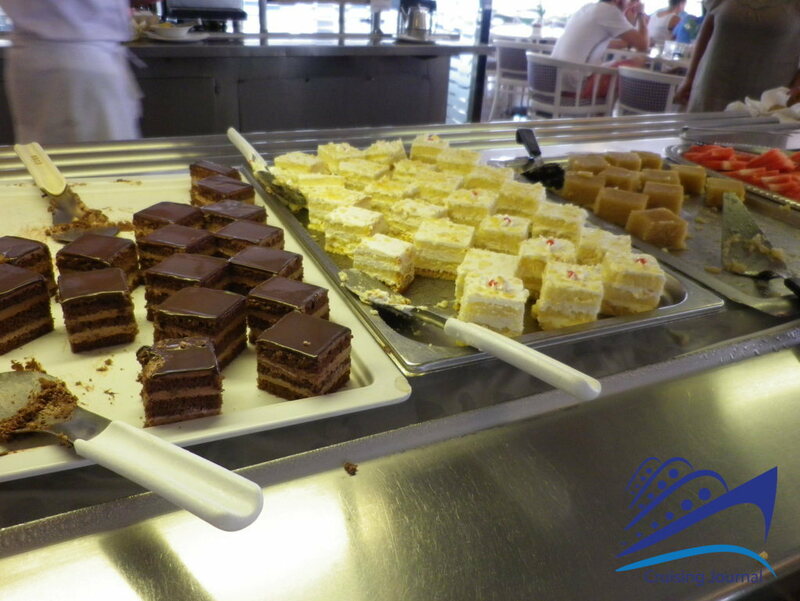 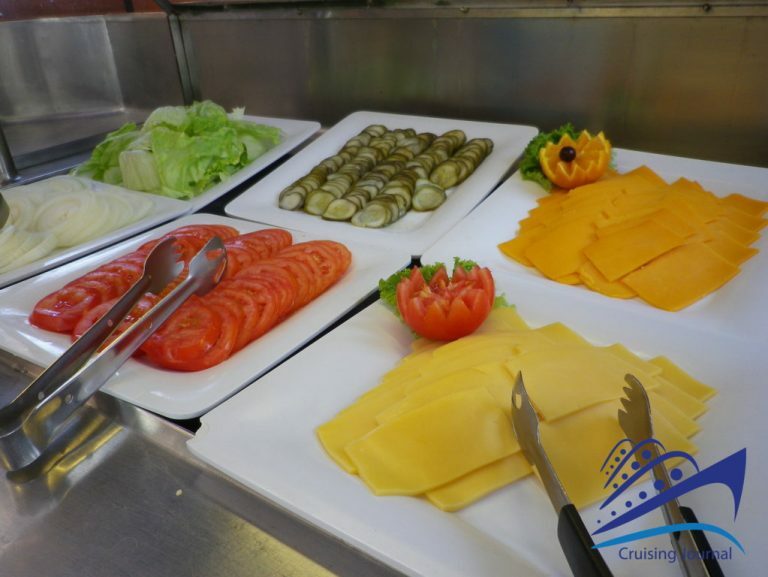 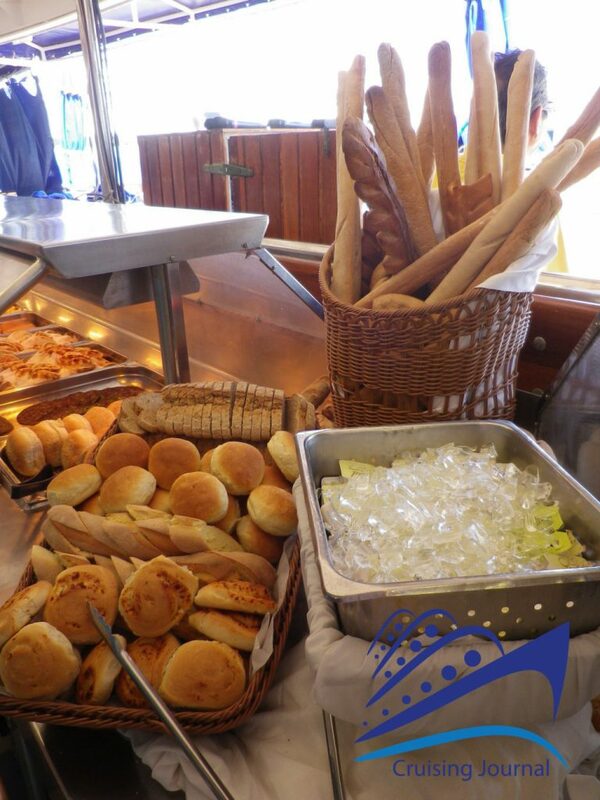 And finally, open only for lunch, is the Aura Grill, a small buffet located on Lido deck 9 that offers vegetables, pizza, Greek gyros, feta cheese and olives, hamburgers and chips, and some sweets. 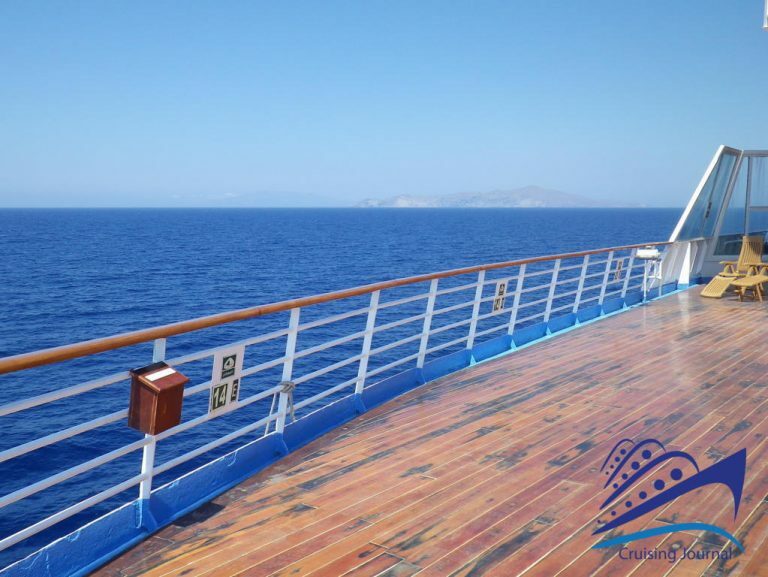 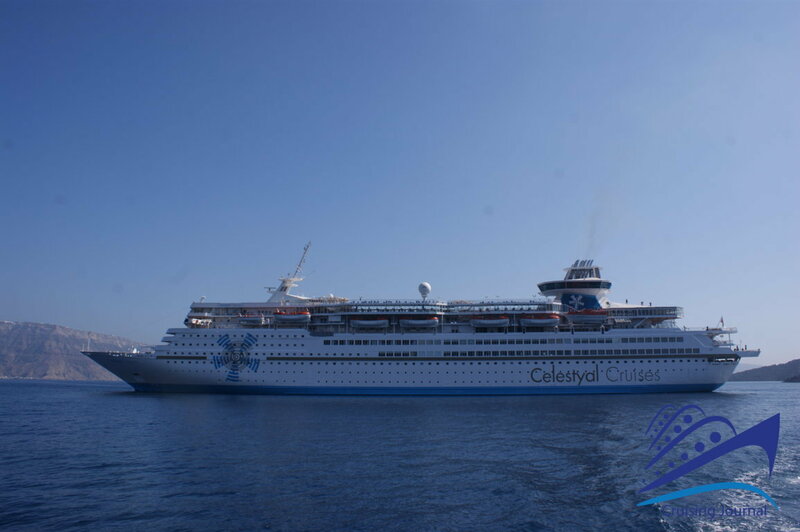 The Celestyal Cruises’ ships have the exclusive advantage of offering brief itineraries in the Mediterranean during the summer that include really interesting stopovers in a short amount of time. 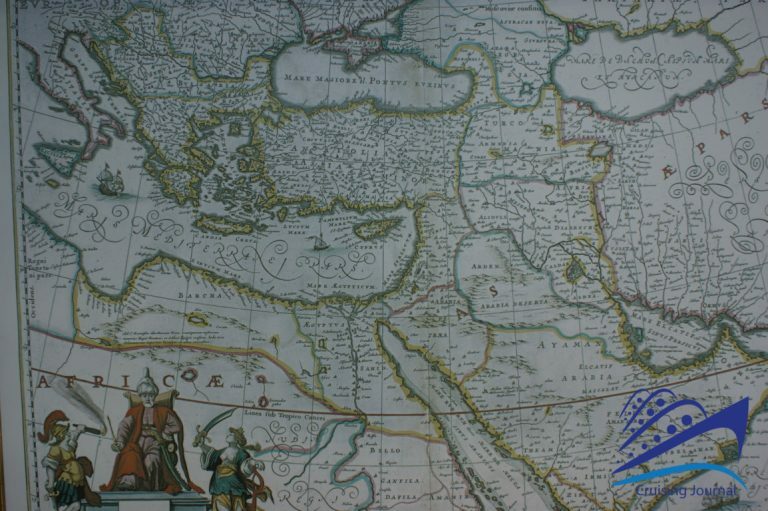 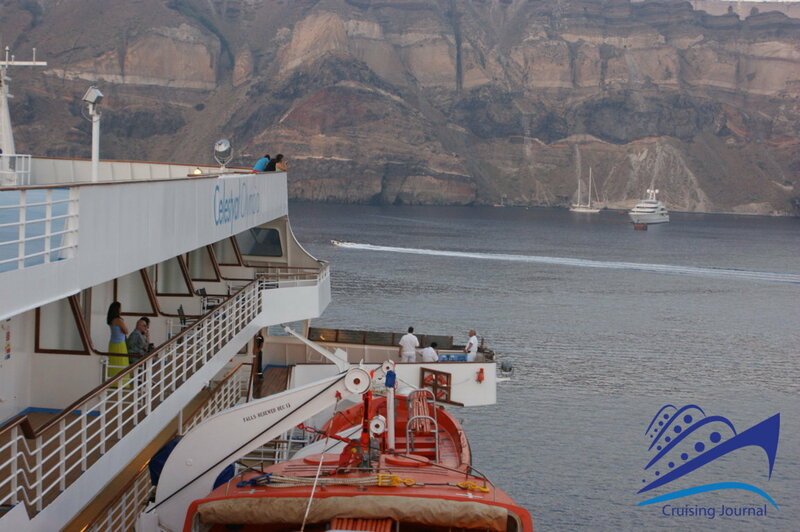 Among the destinations usually offered are: Mykonos, Kusadasi, Patmos, Heraklion, and Santorini. 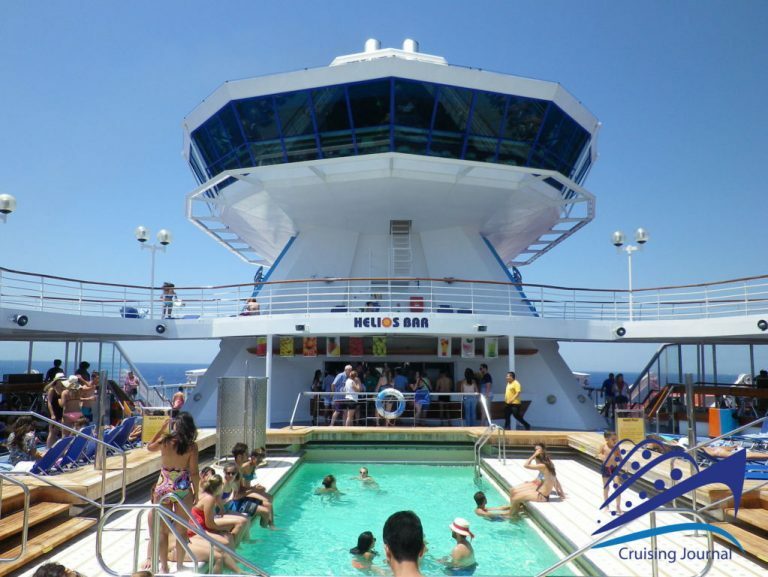 It presents an opportunity for a short cruise among these marvelous islands without many onboard frills. Do not miss the complete Photo Album and all the users’ Reviews with opinions and comments about Celestyal Olympia.